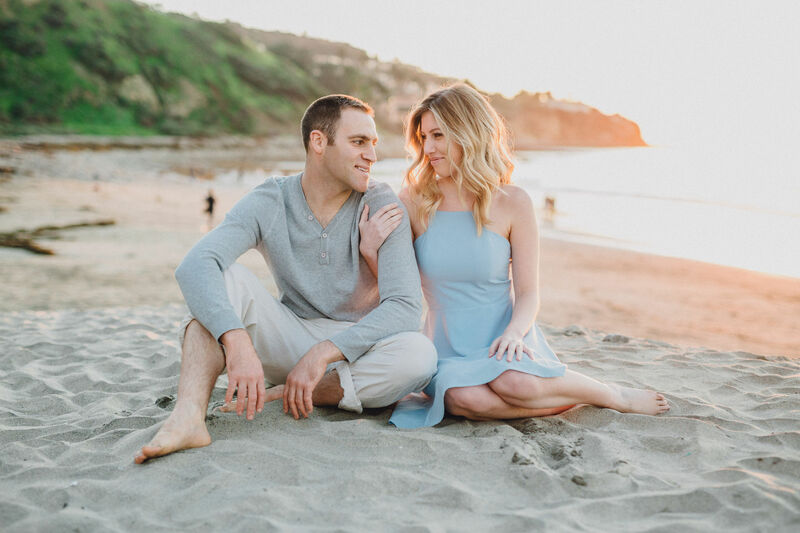 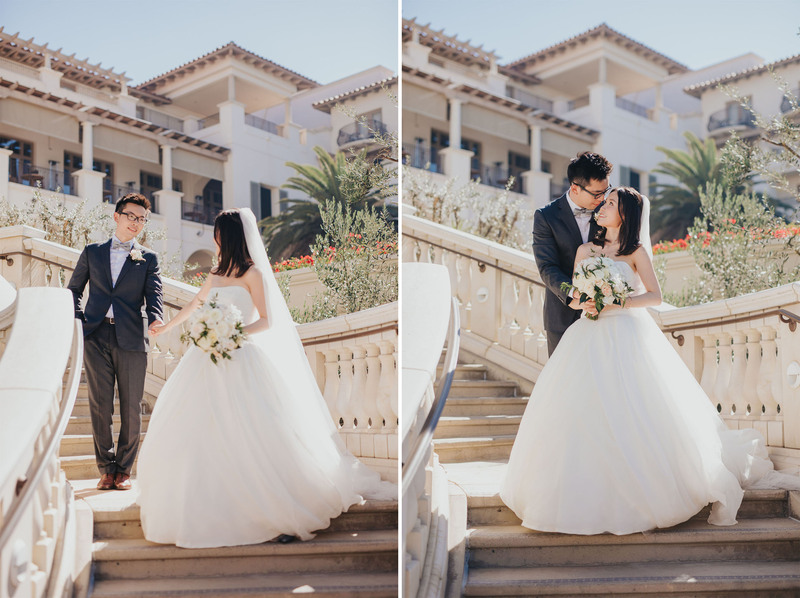 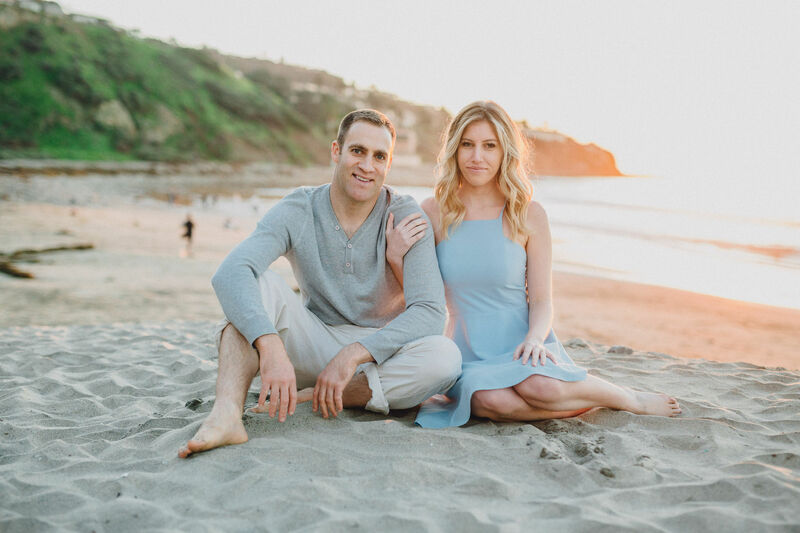 It was a beautiful day at Monarch Beach Resort in Dana Point, California for Emily and Sean’s wedding. 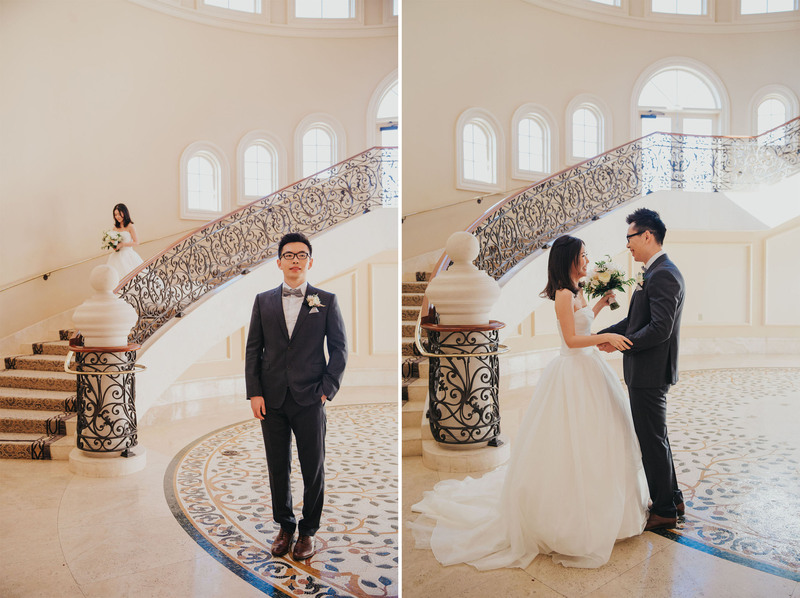 Everything from the venue to the decor was absolutely perfect. 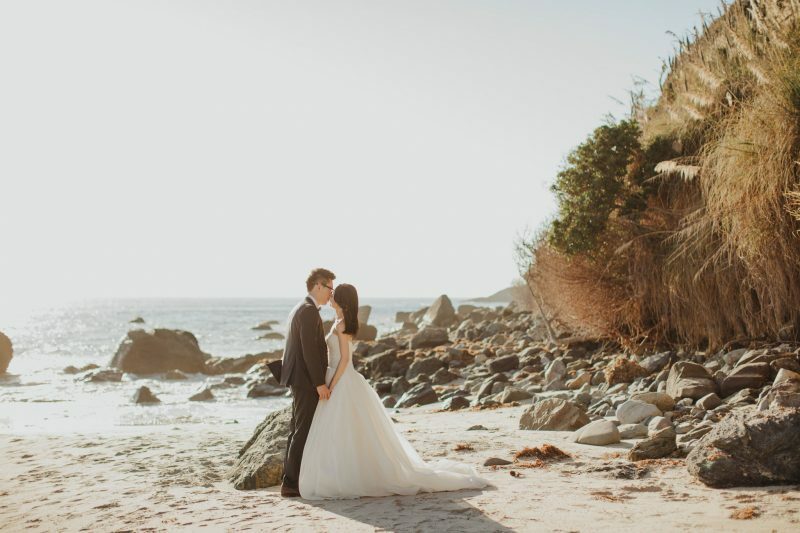 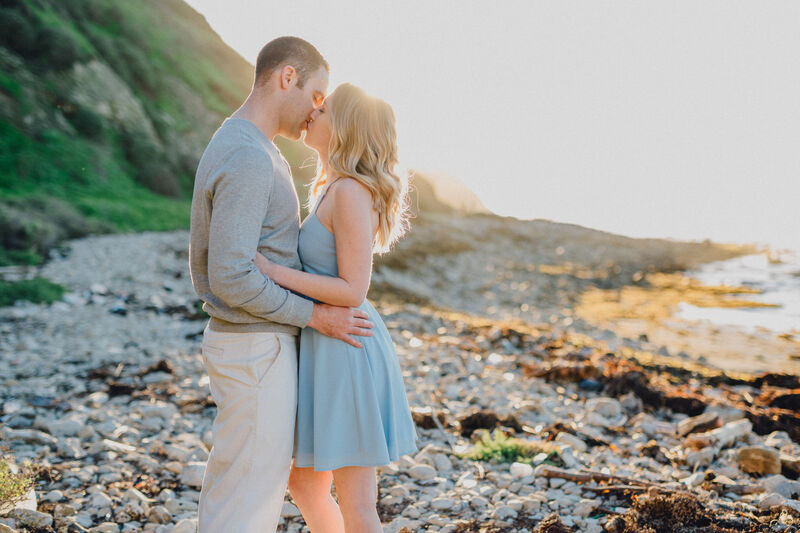 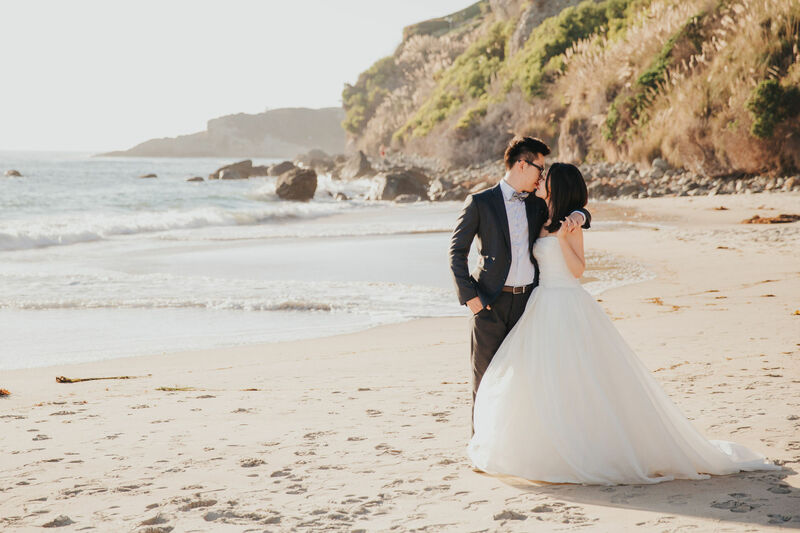 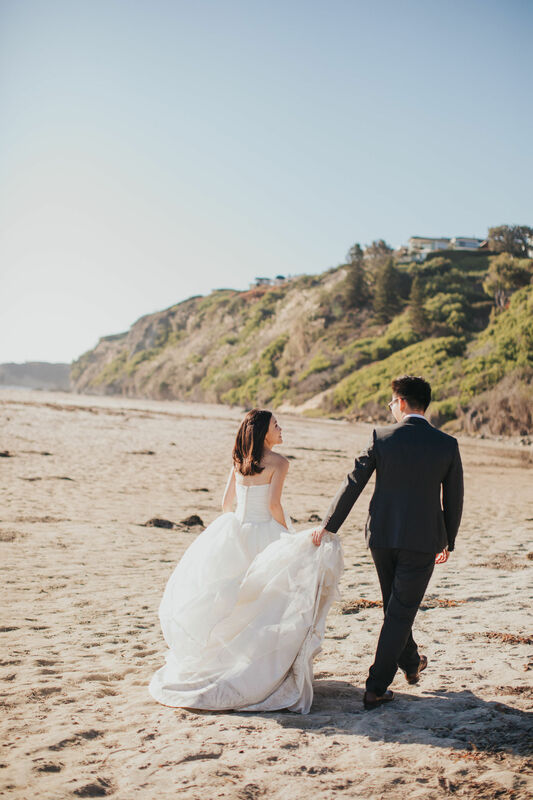 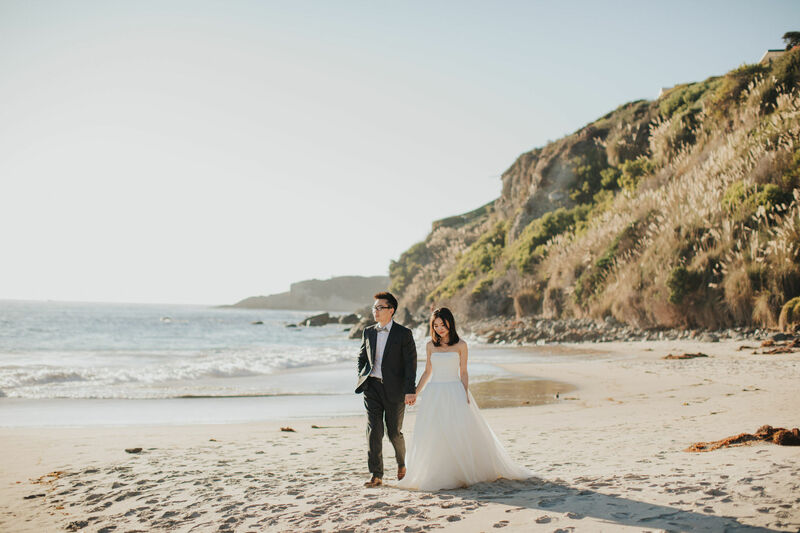 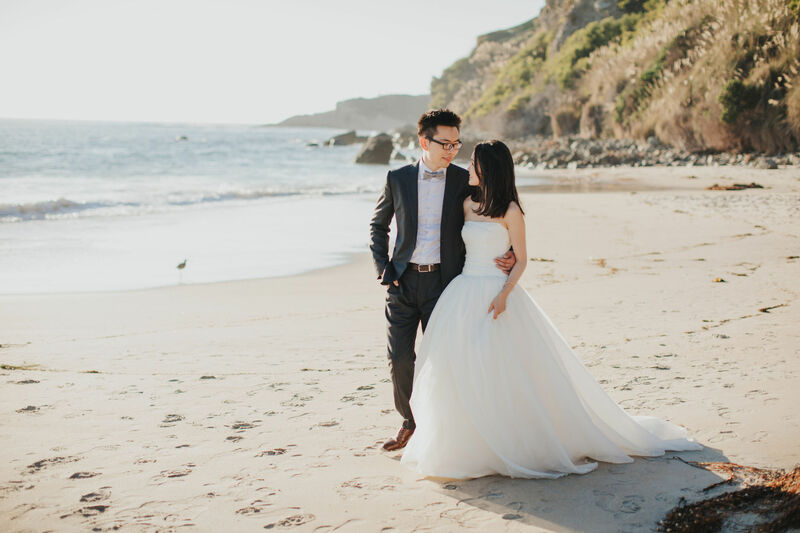 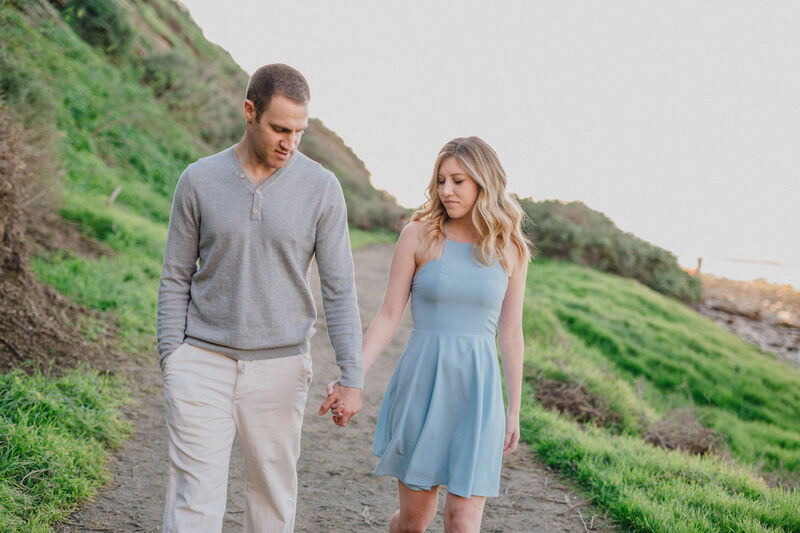 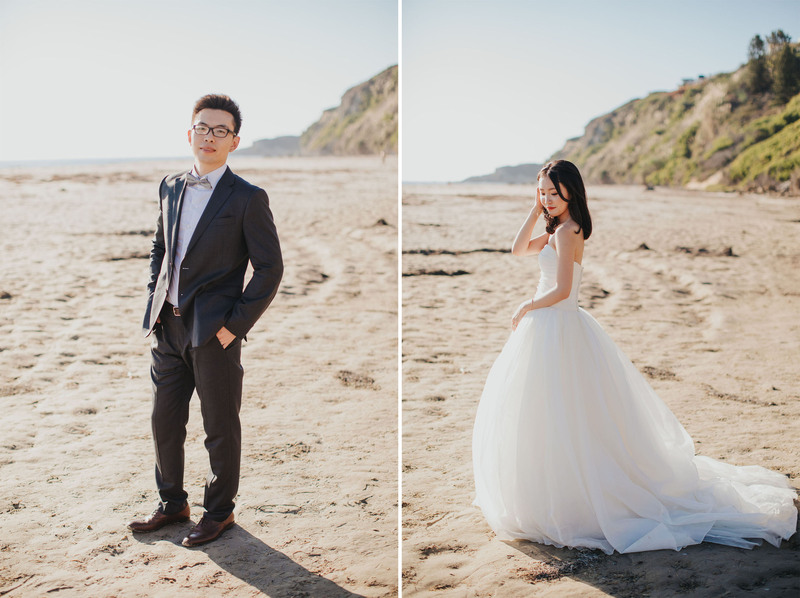 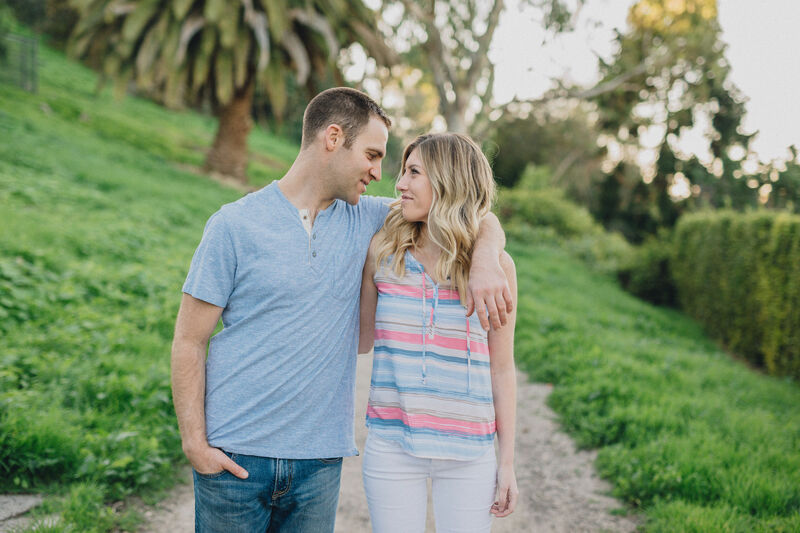 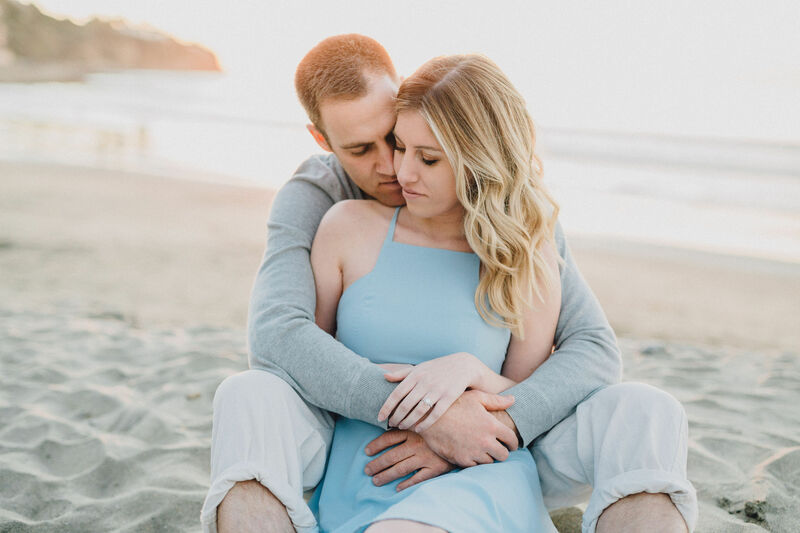 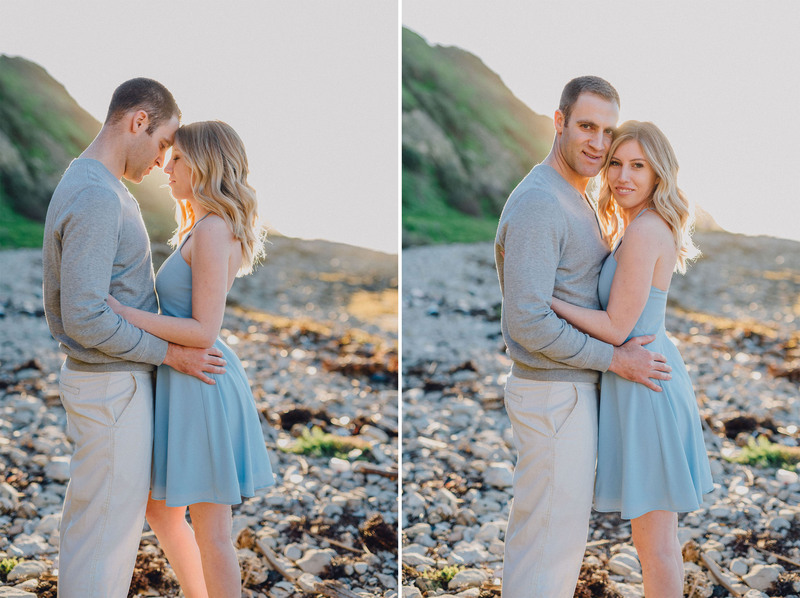 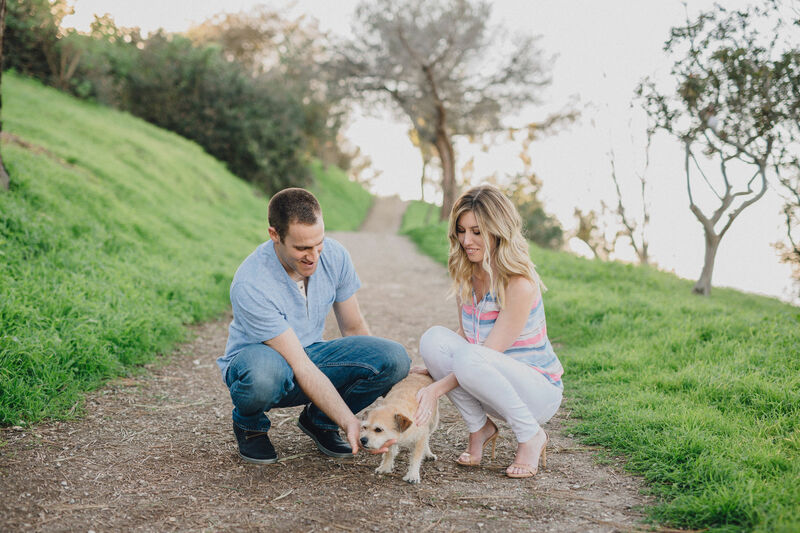 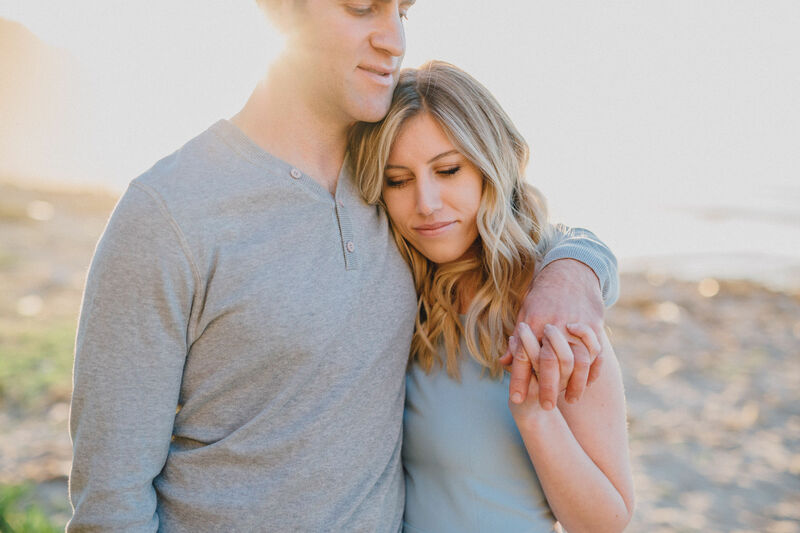 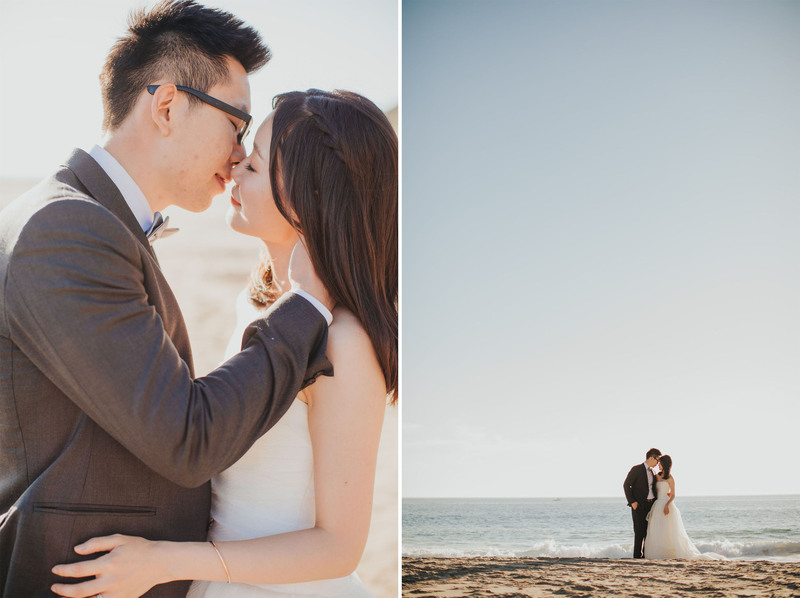 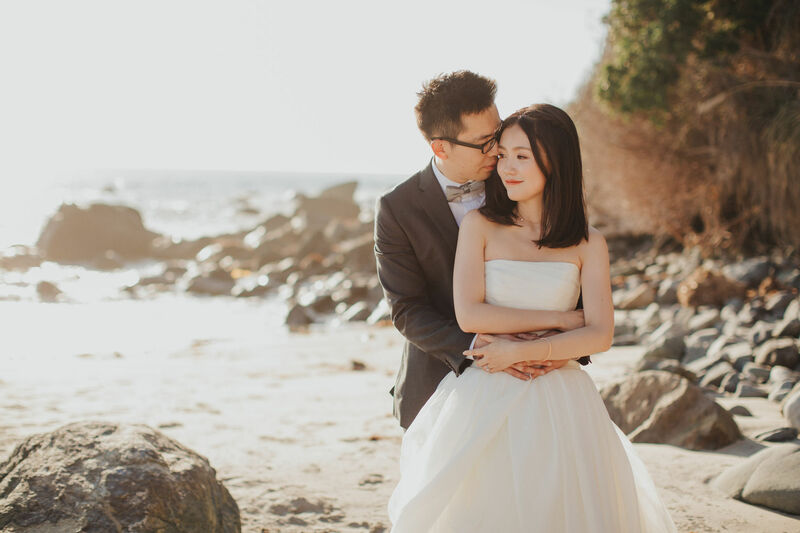 What can be more romantic than getting married on the Southern California coast? 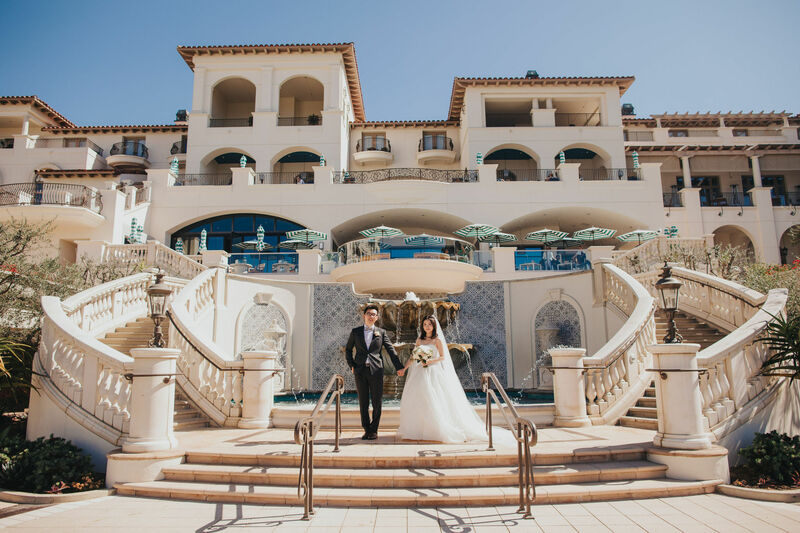 Monarch Beach Resort offers several oceanfront venues that fit any style you are looking for. 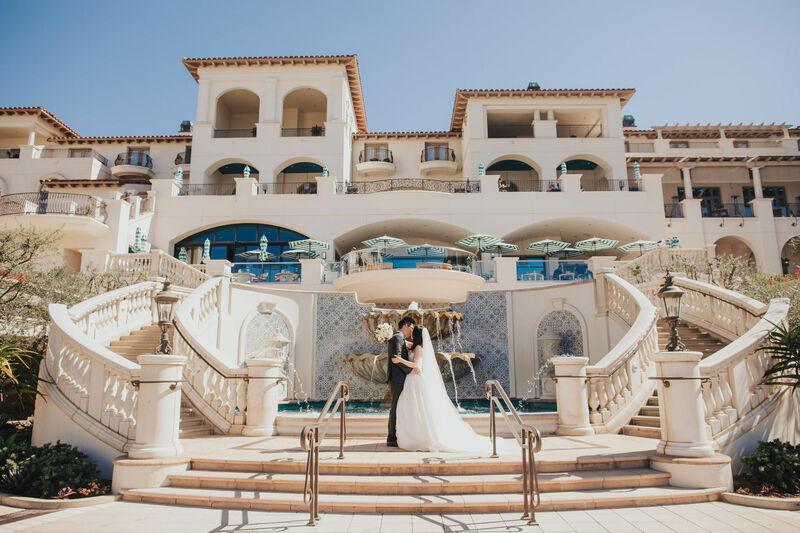 Whether you desire an intimate setting or plan to host 800 guests, this resort has it all. 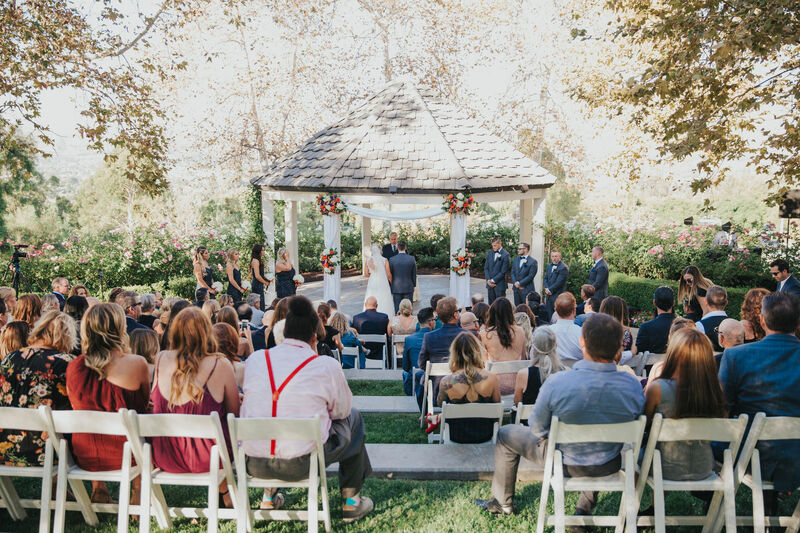 Also, couples have the choice between one of their four different ceremony locations. 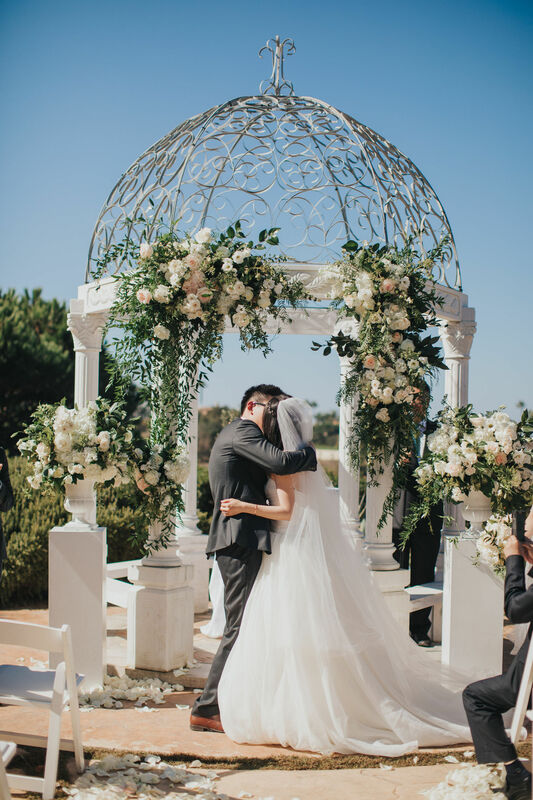 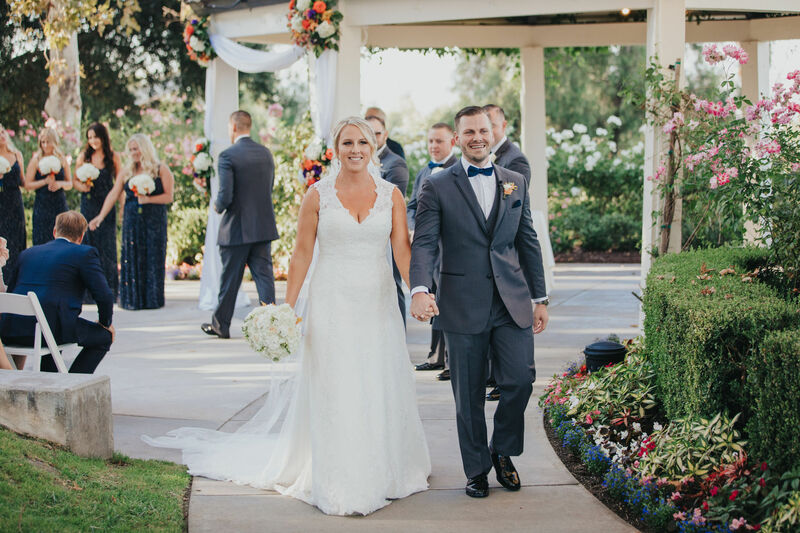 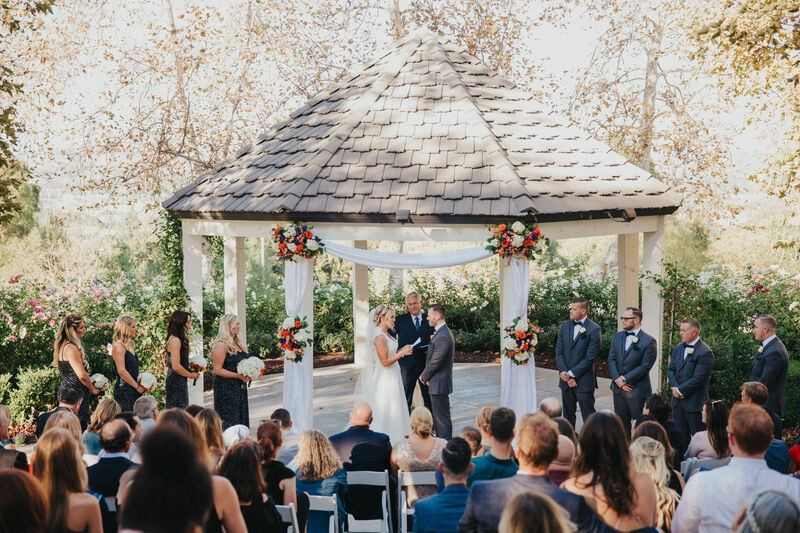 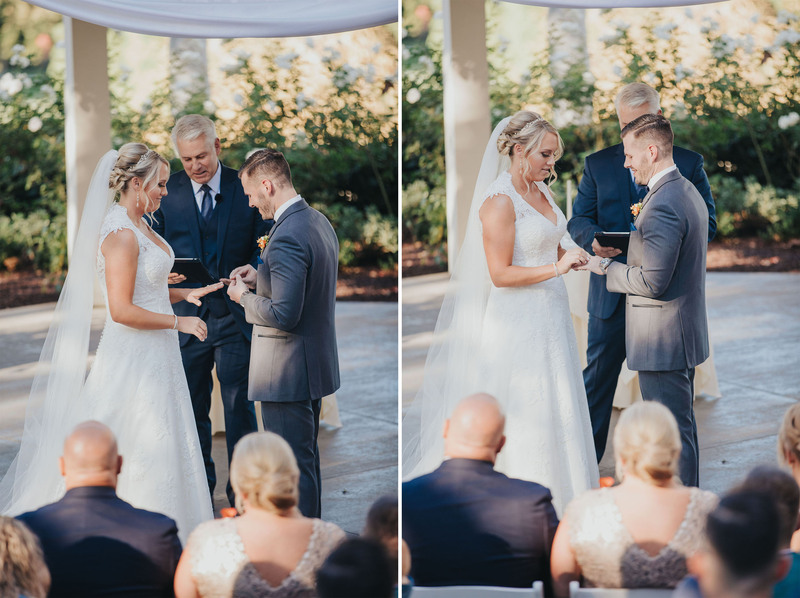 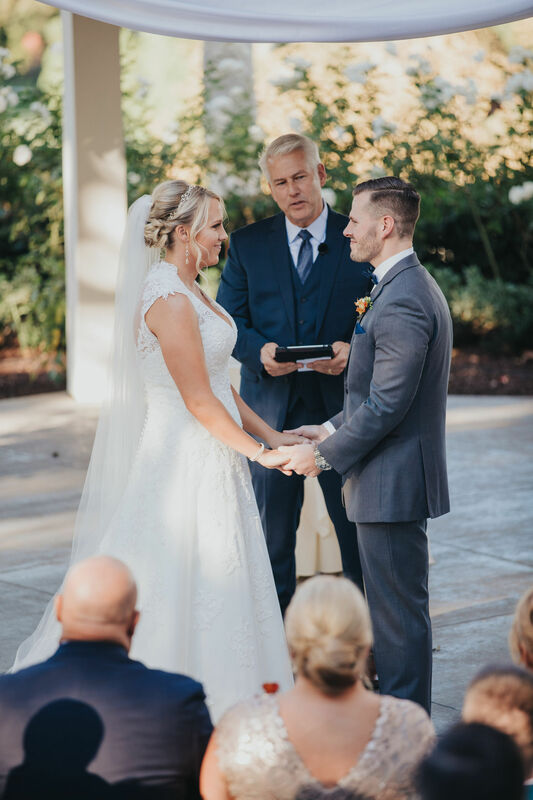 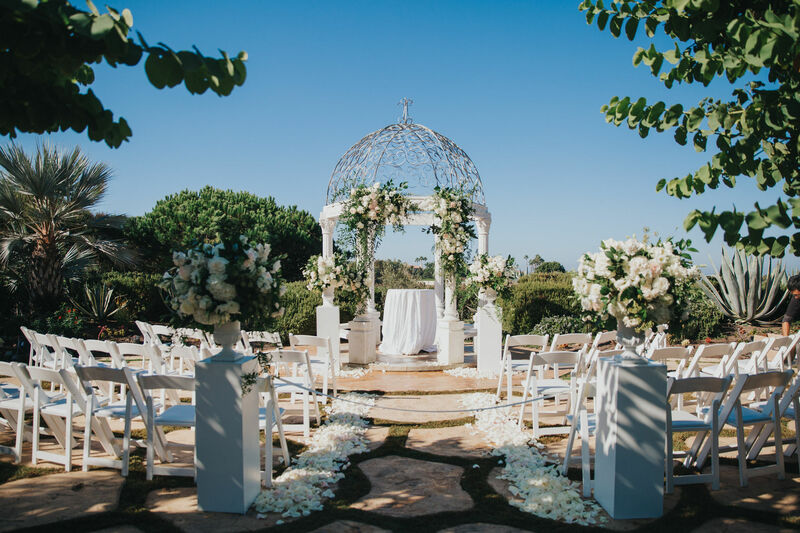 Emily and Sean exchanged vows in the Botanical Garden under Monarch Beach Resort’s beautifully structured wedding arch. 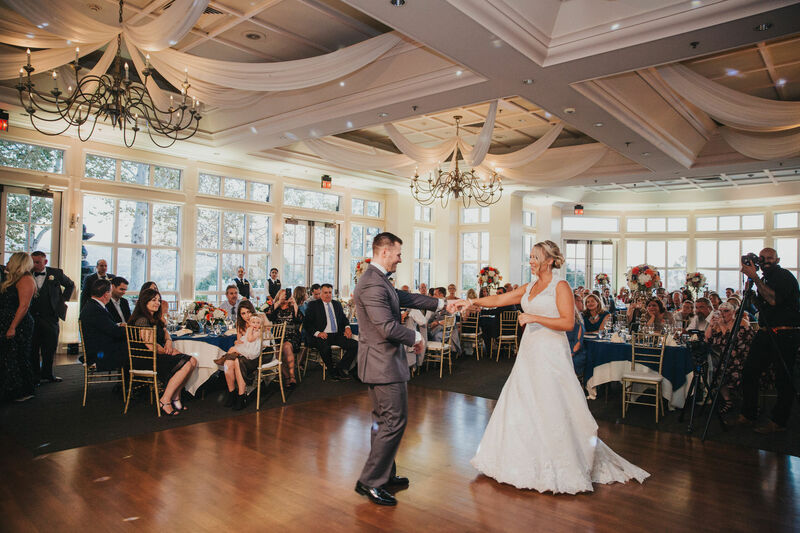 The reception took place at Club 19, which showcases an outdoor terrace with views of the ocean and golf course. 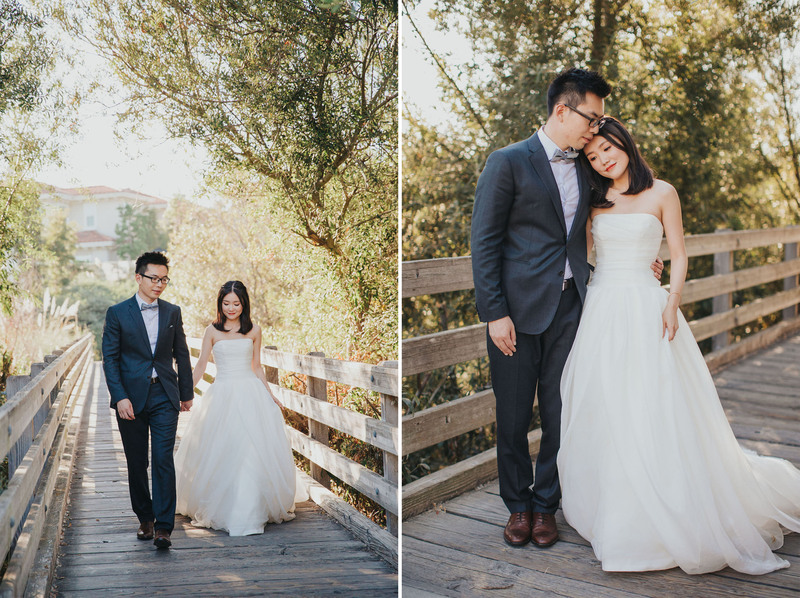 Emily opted for a lovely strapless ball gown wedding dress for the ceremony. 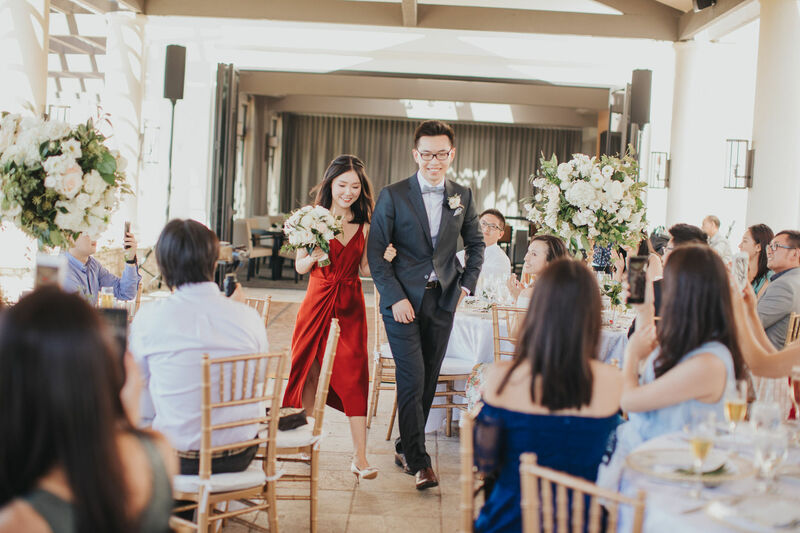 Later on, she changed into a red silk dress for the reception. 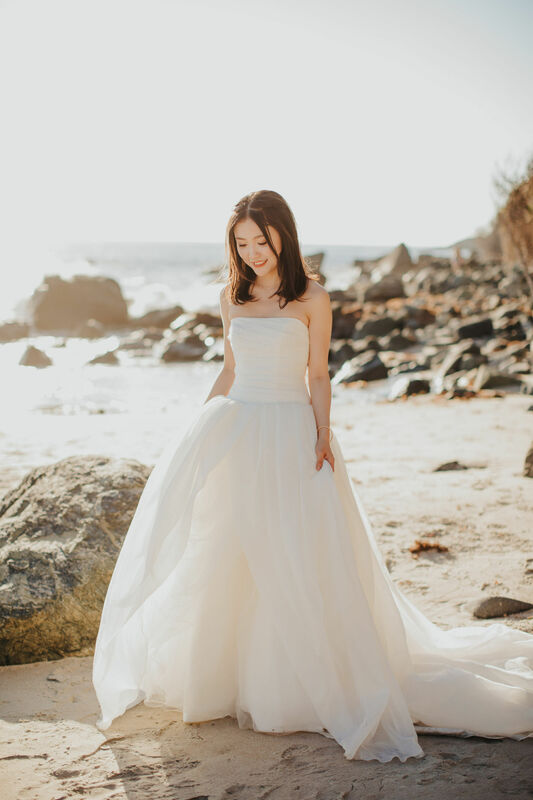 To all our future brides, changing dresses for the reception is such an ultimate game changer! 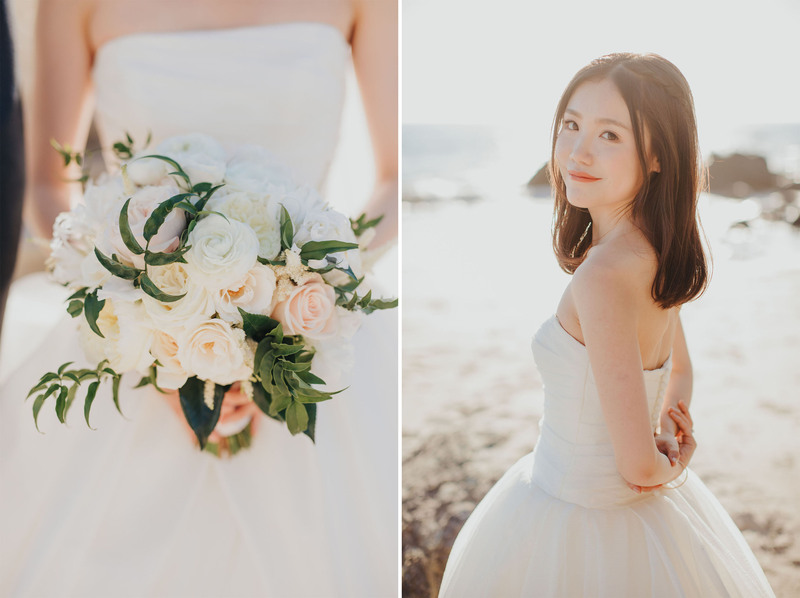 Her white and light pink rose bouquet truly brought the whole look together. 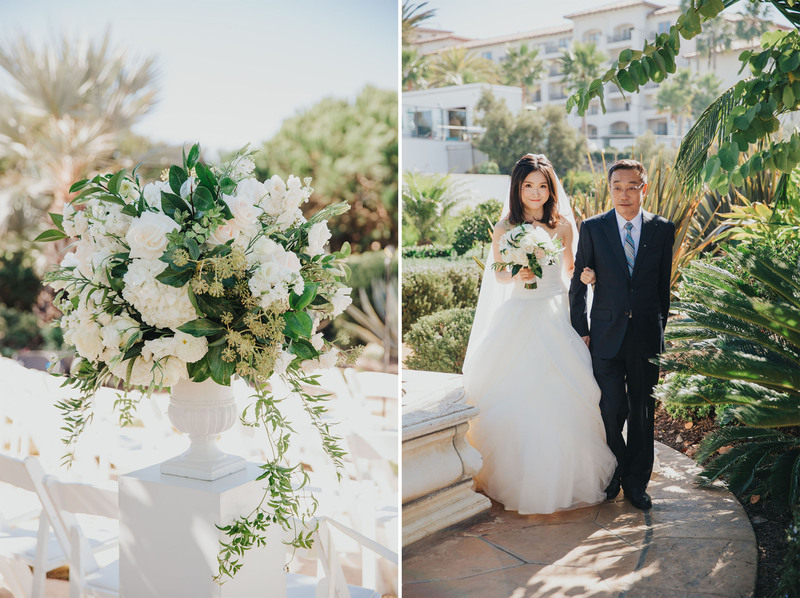 After a photoshoot with the newlyweds across the Monarch Beach Resort’s grounds and the beach, the reception was about to begin. 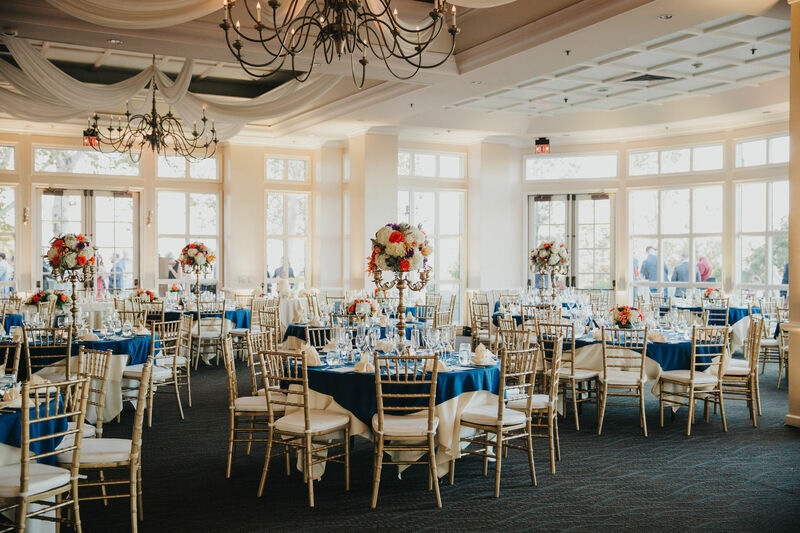 The wedding reception decor was absolutely stunning. 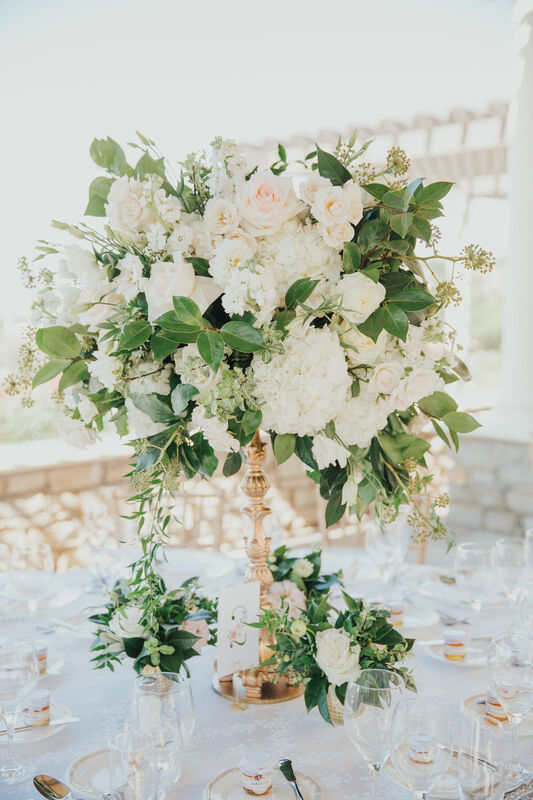 Most noteworthy, the tall wedding centerpieces included white roses, light pink roses and everyone’s favorite, hydrangeas. 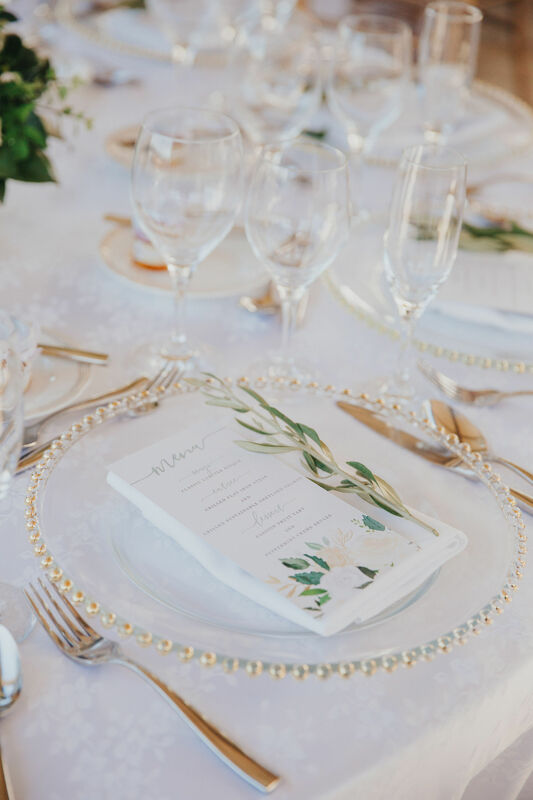 Every place setting had a beautiful clear charger with gold studs around the perimeter. 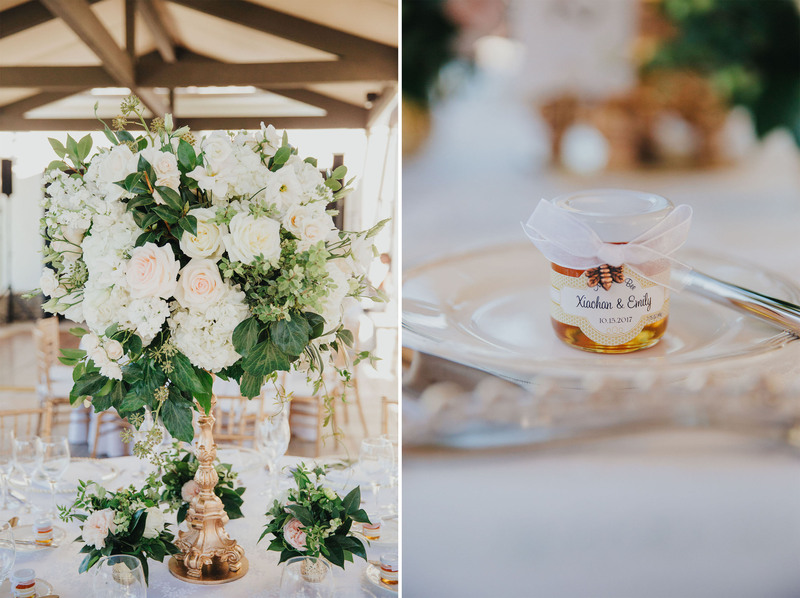 Emily and Sean’s guests were welcomed to their seats with favors, which were personalized jars of honey. 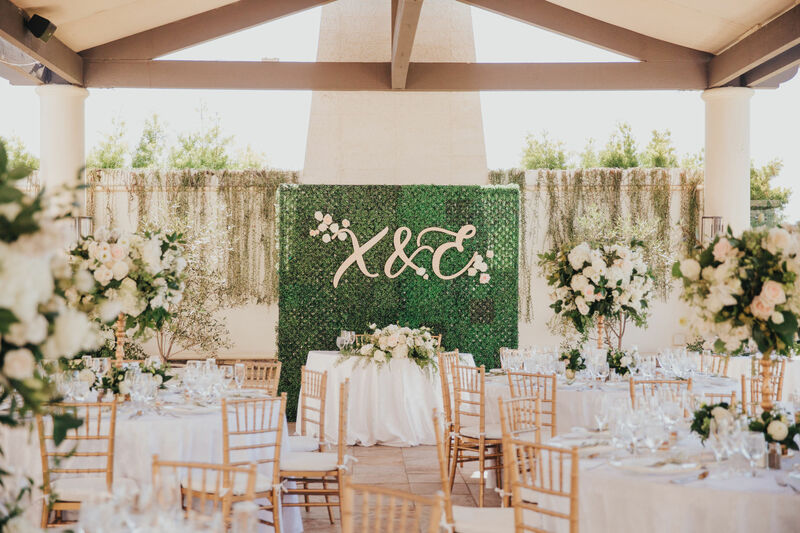 Even the sweetheart table had a backdrop with their initials. 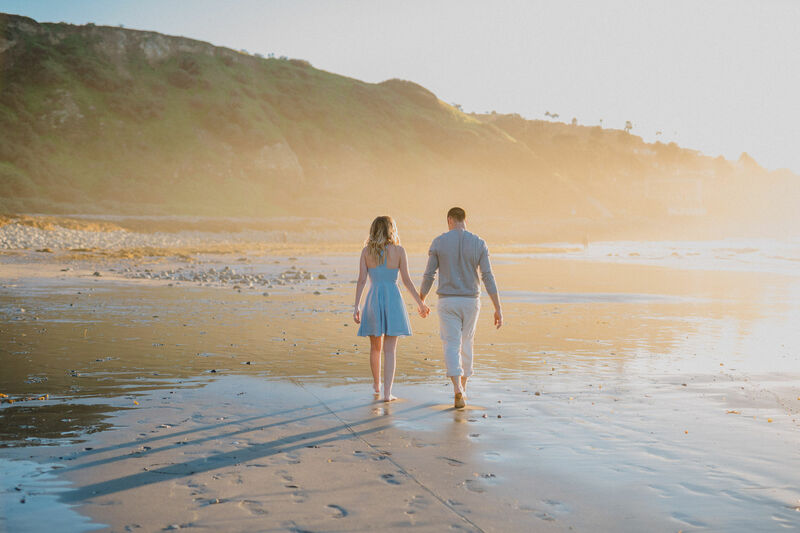 If you want to find out more contact us here. 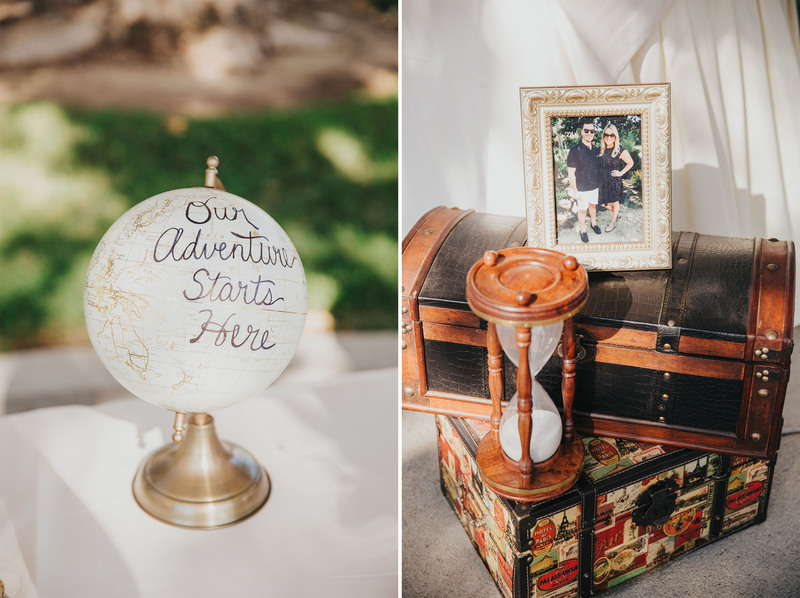 Maloree and Joey’s adventure themed wedding at Summit House sure was one for the books. 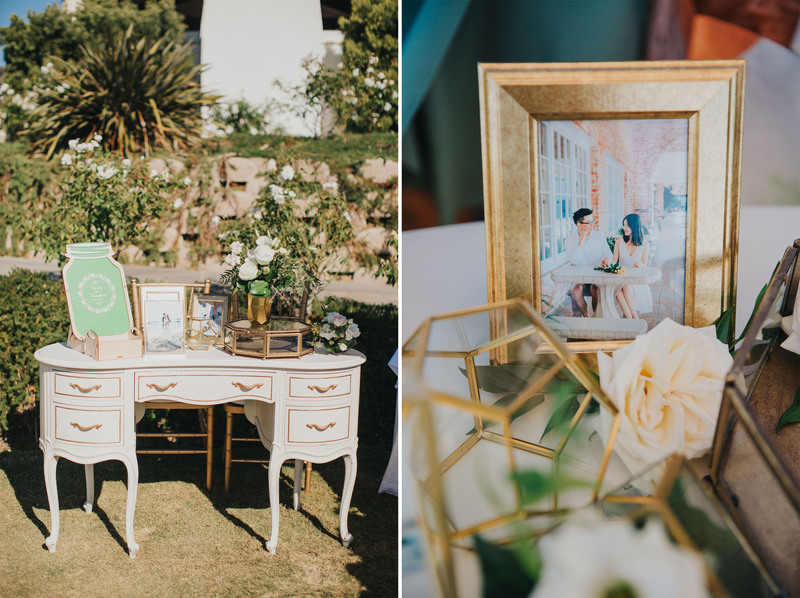 Everything from the venue to the decor was simply perfect. 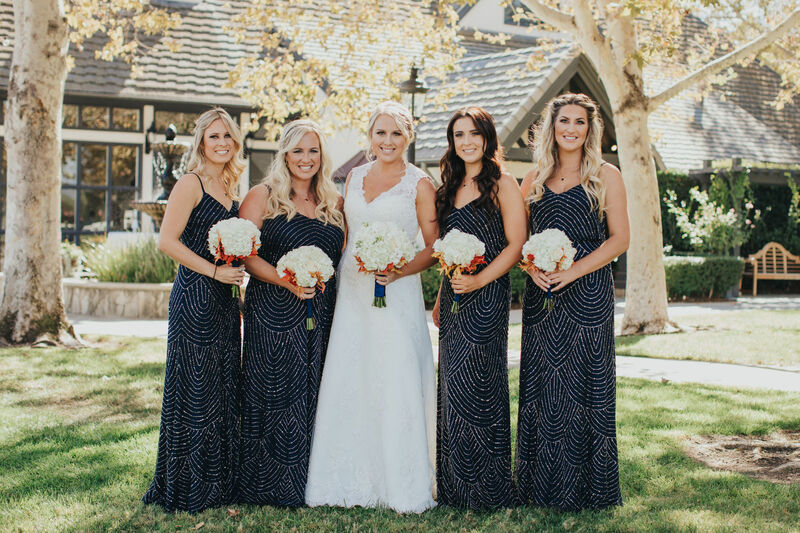 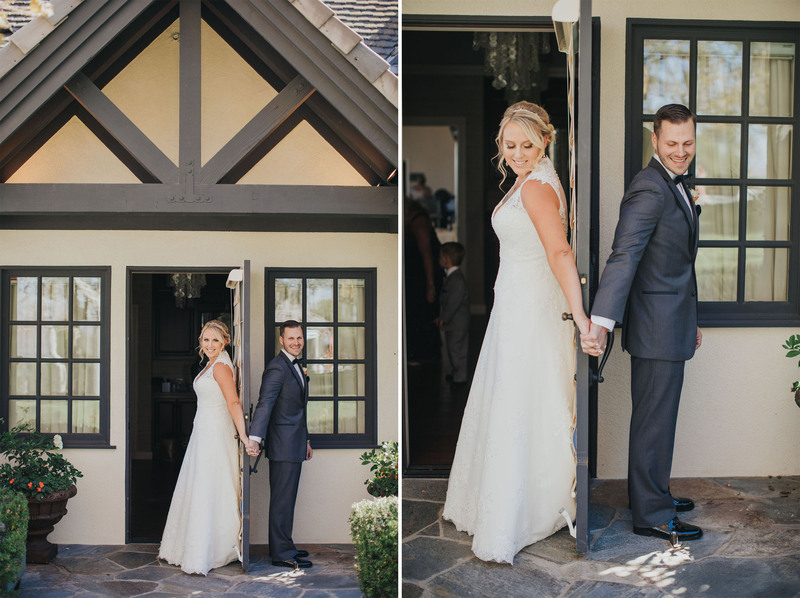 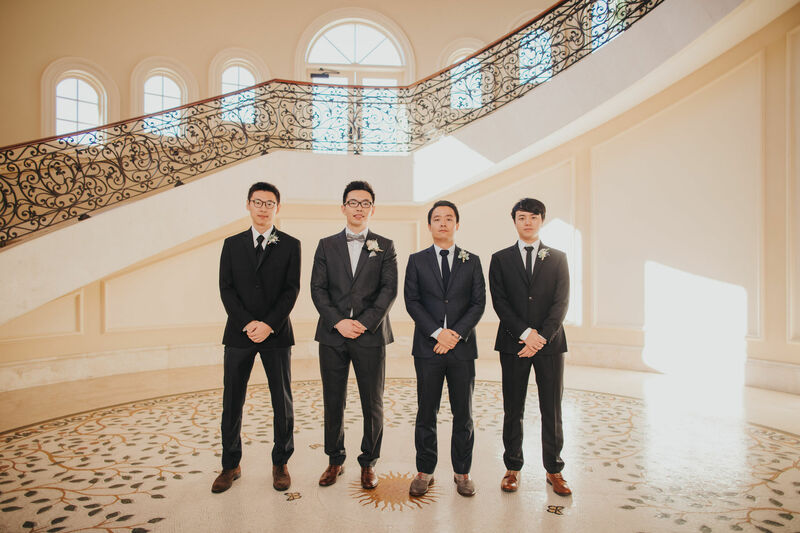 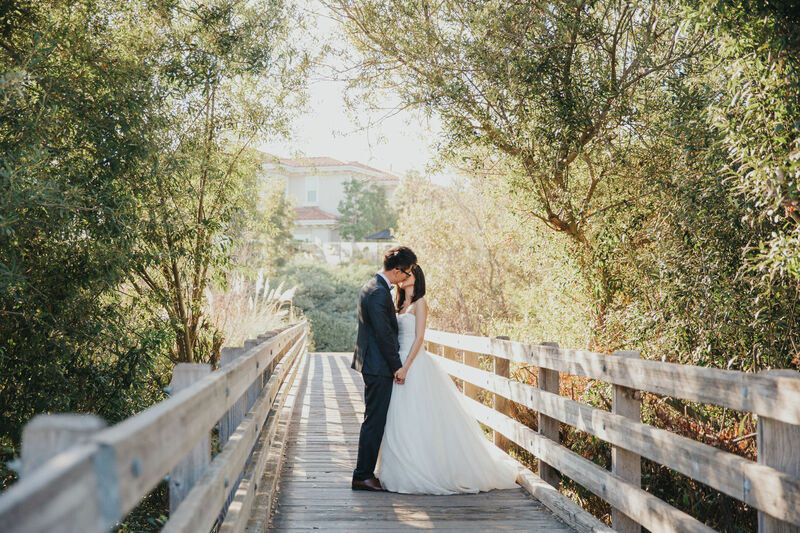 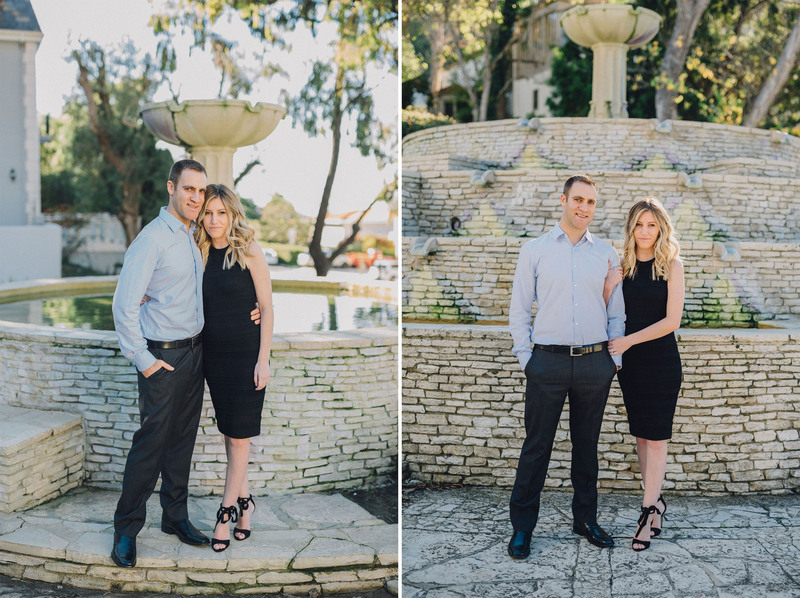 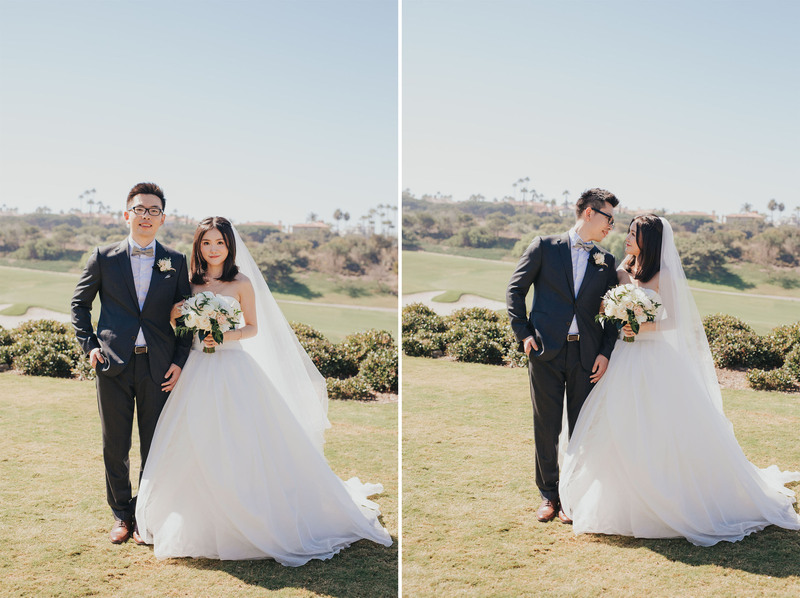 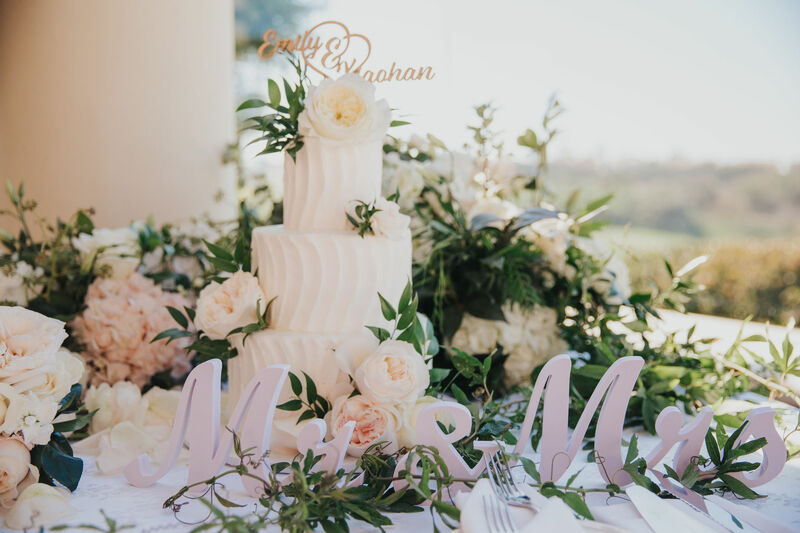 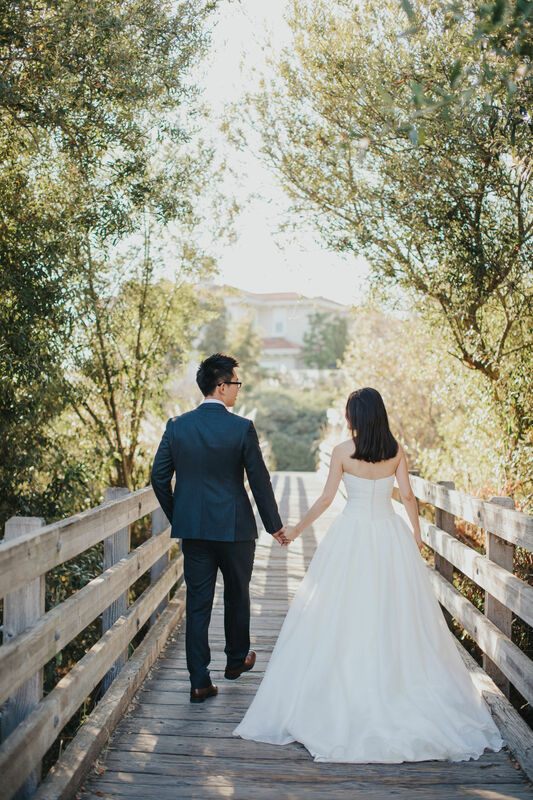 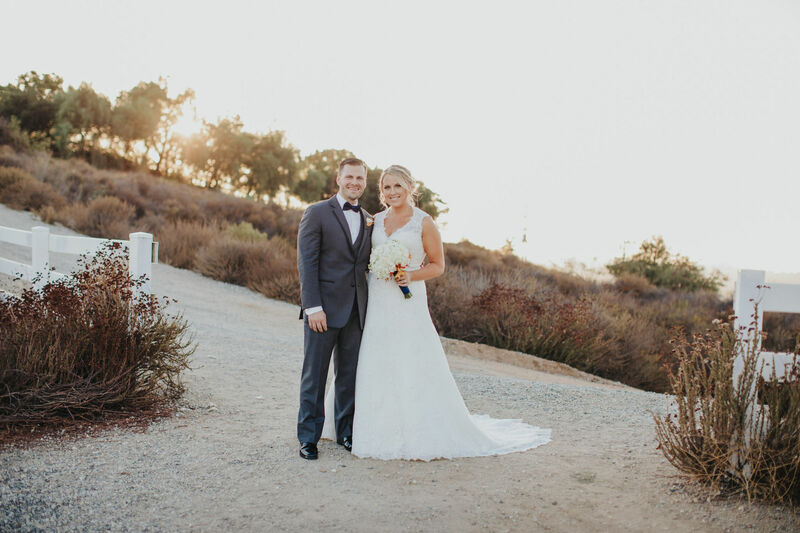 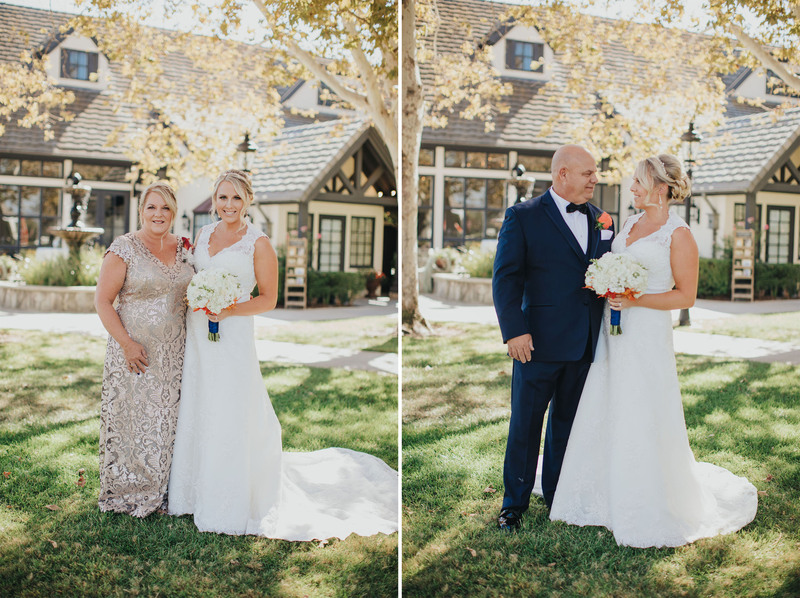 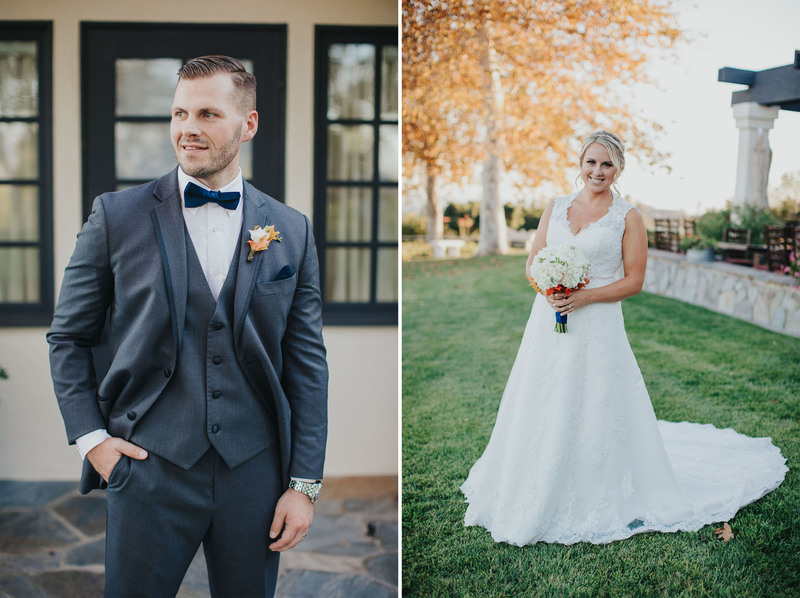 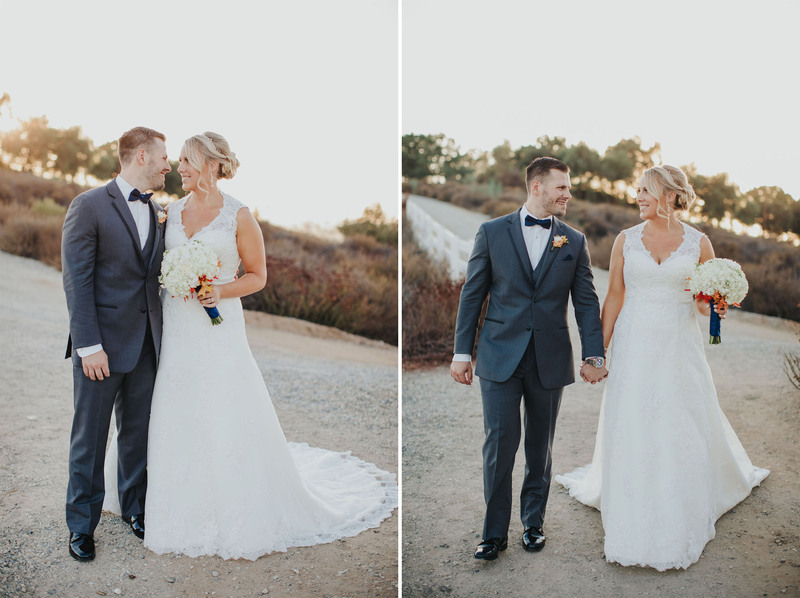 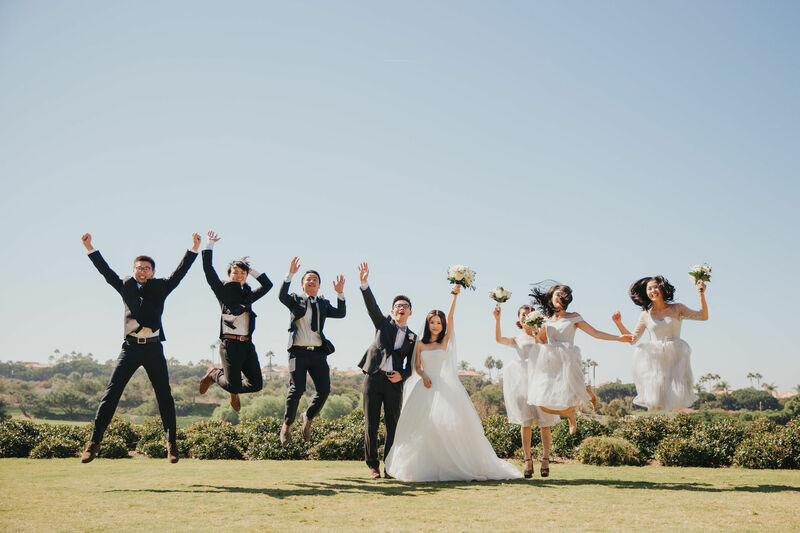 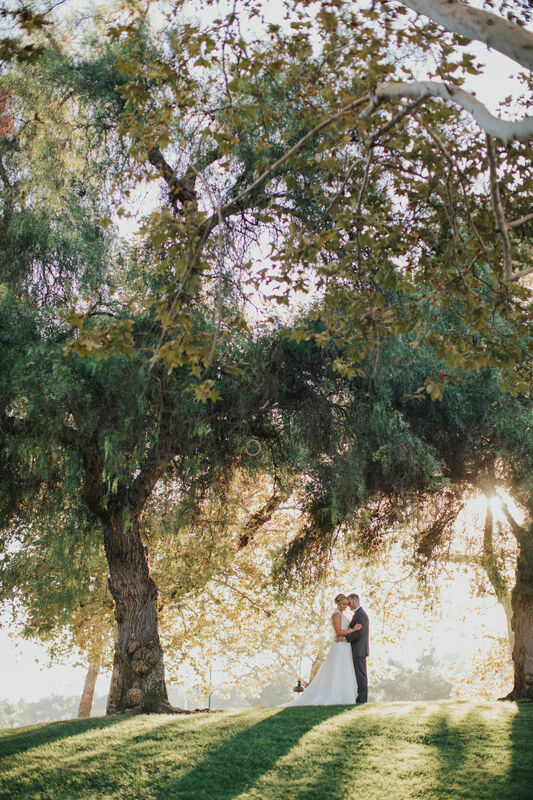 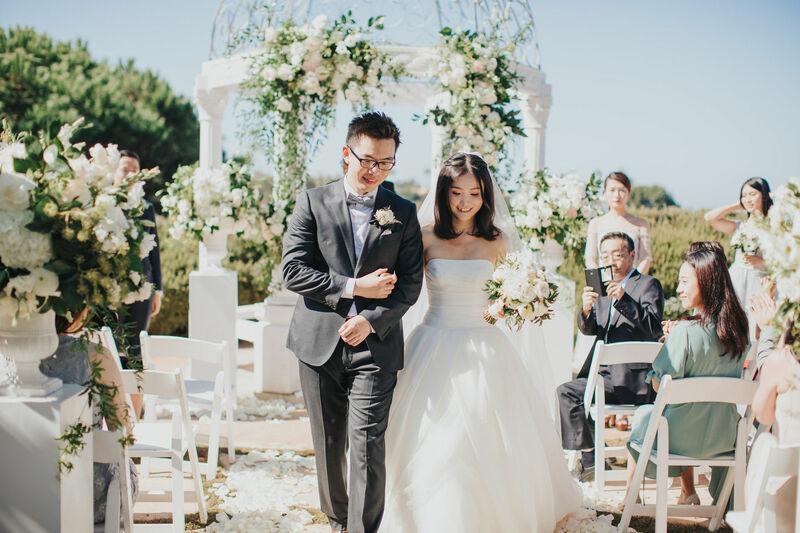 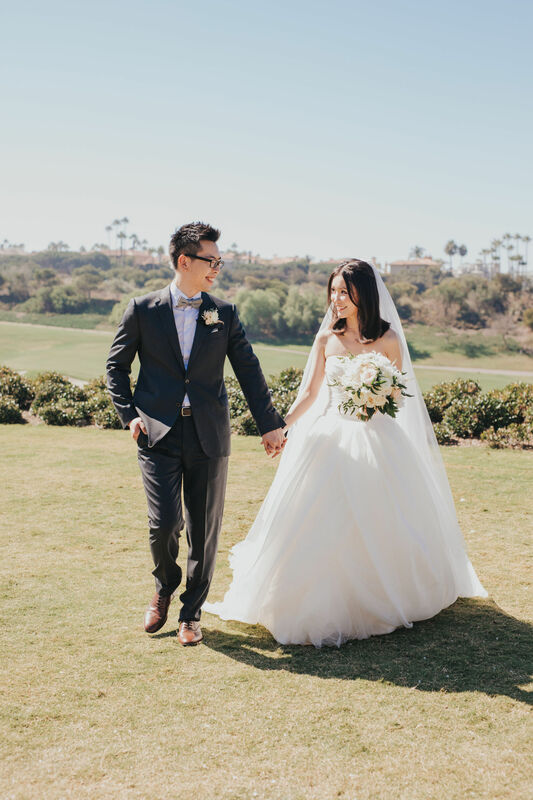 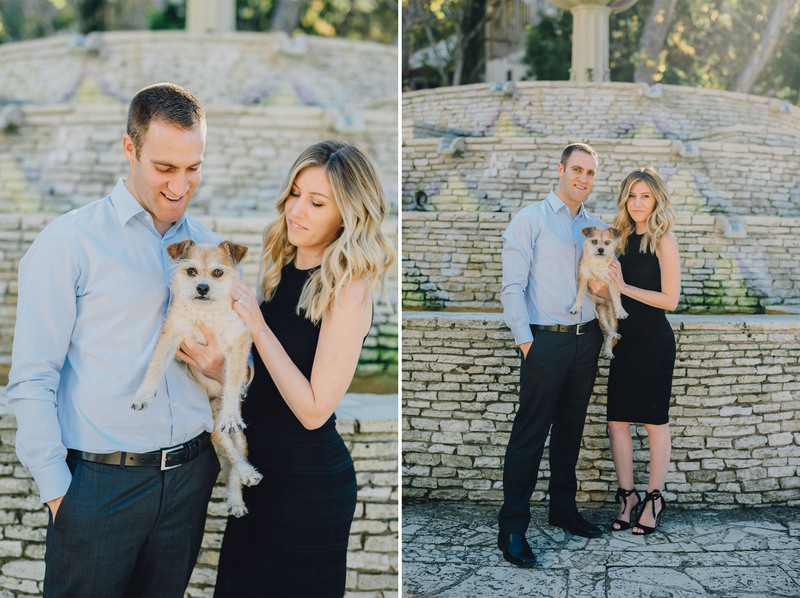 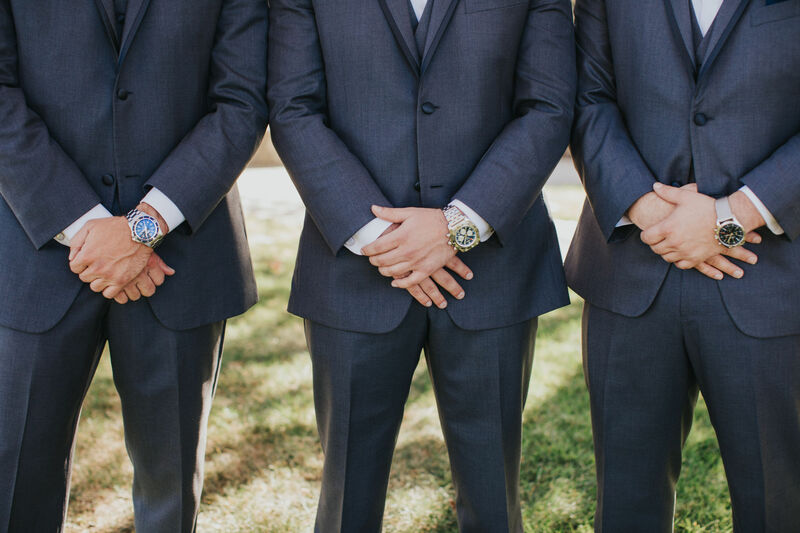 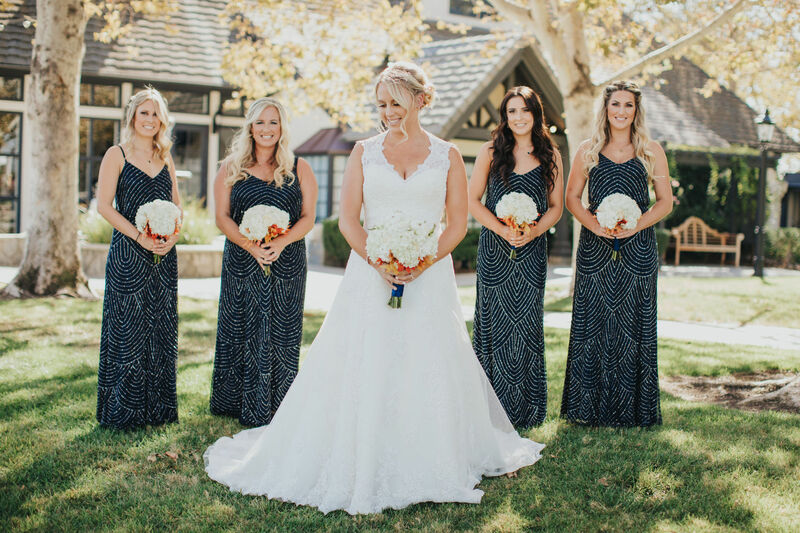 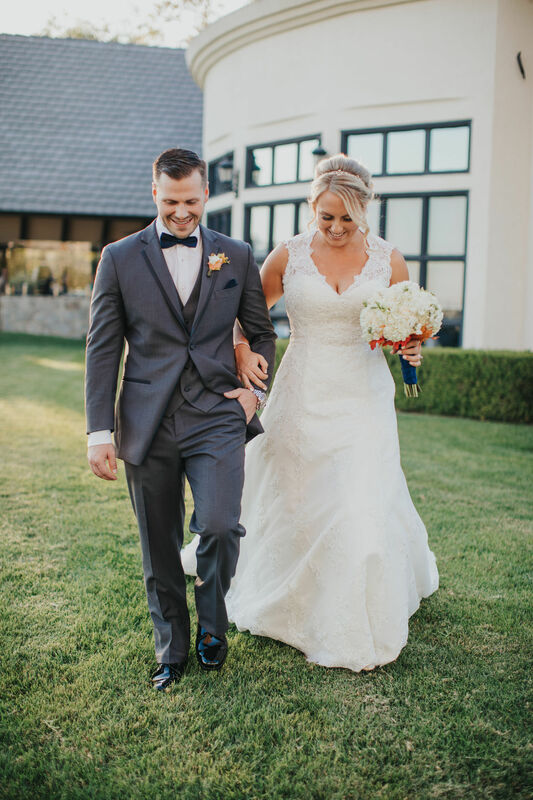 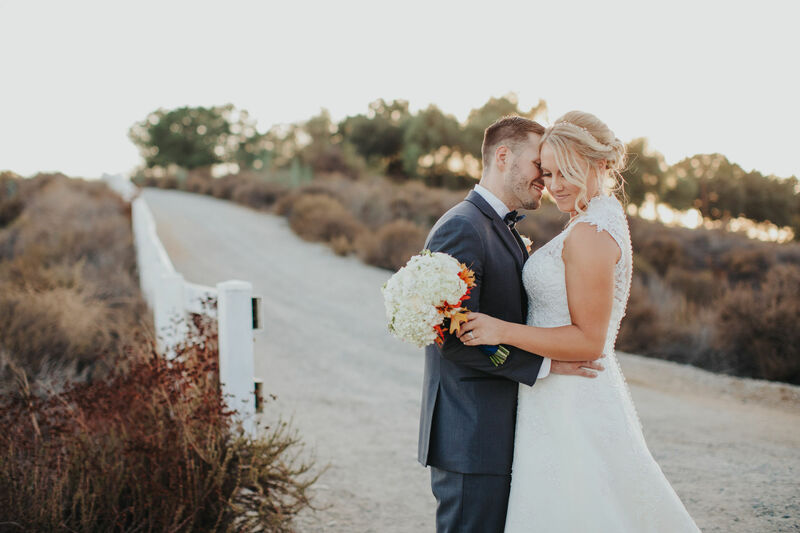 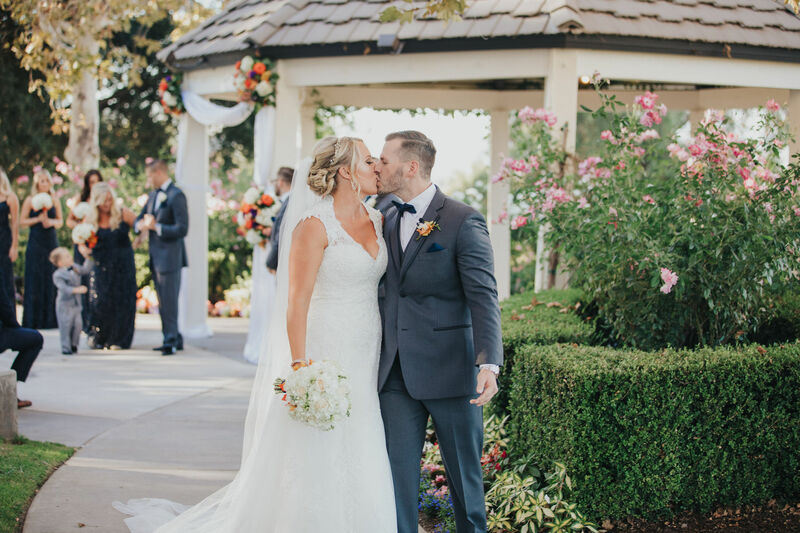 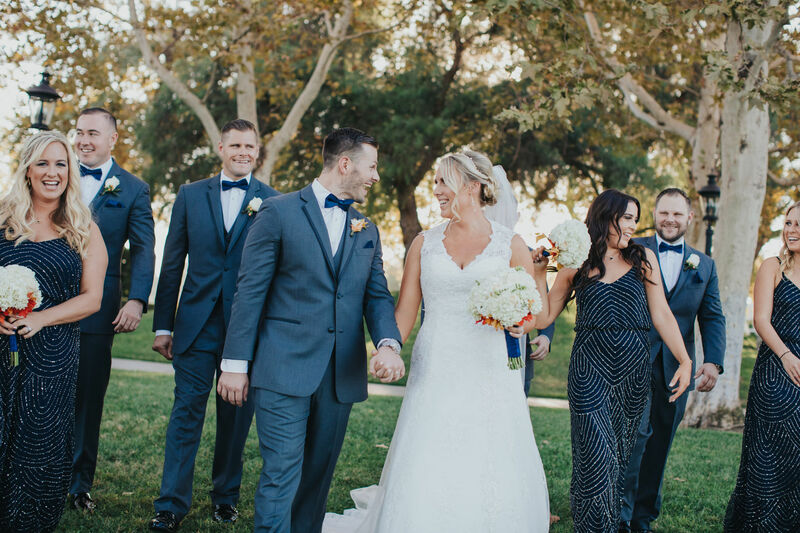 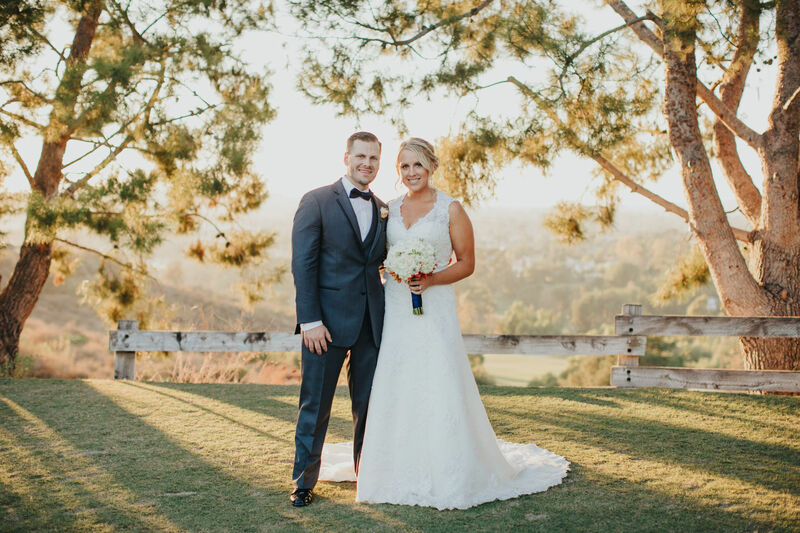 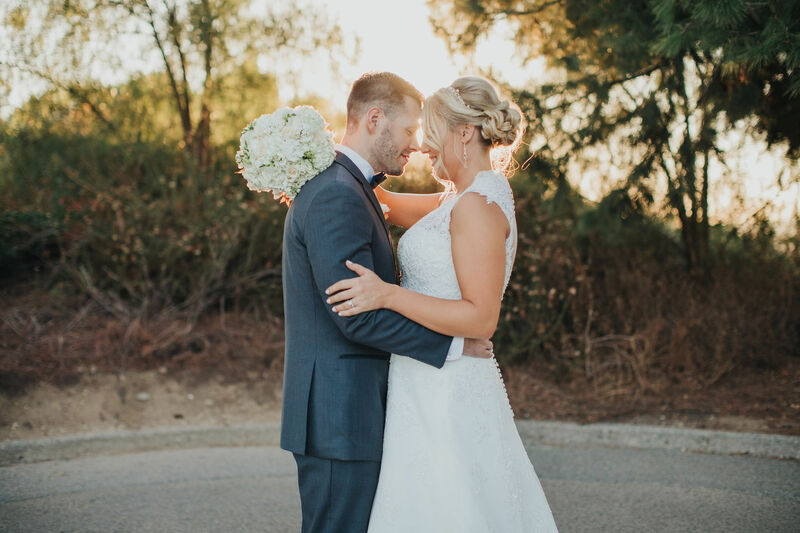 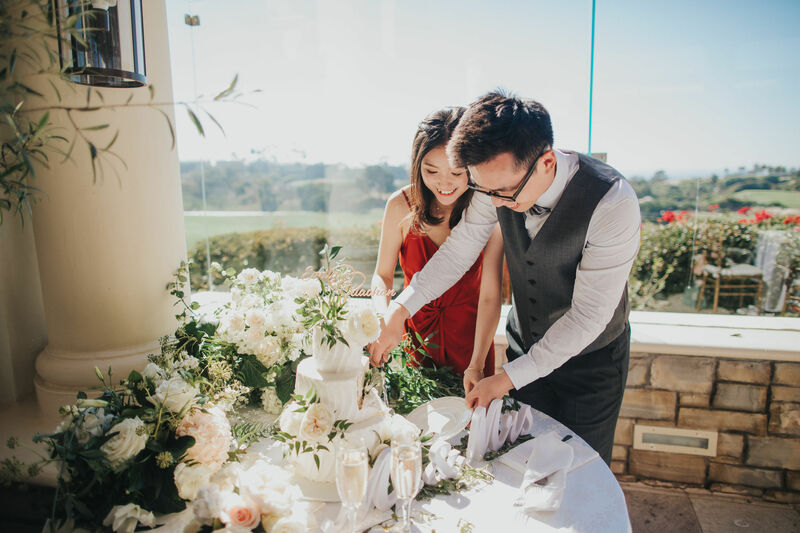 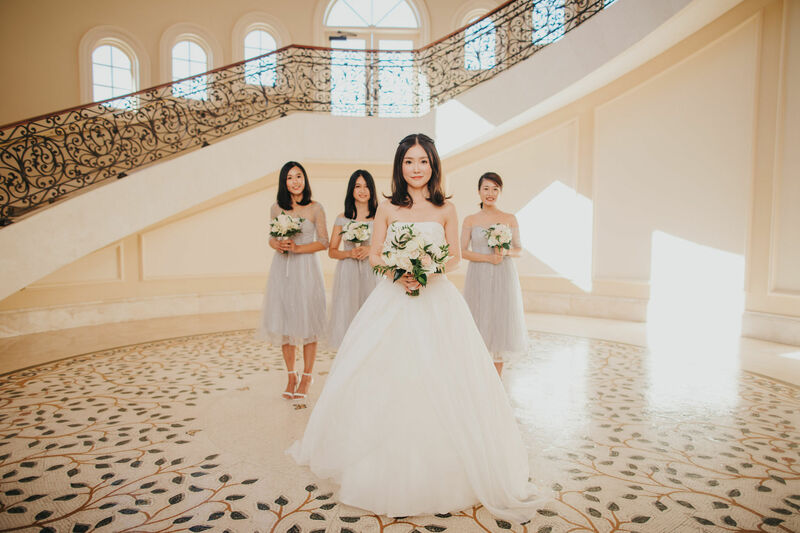 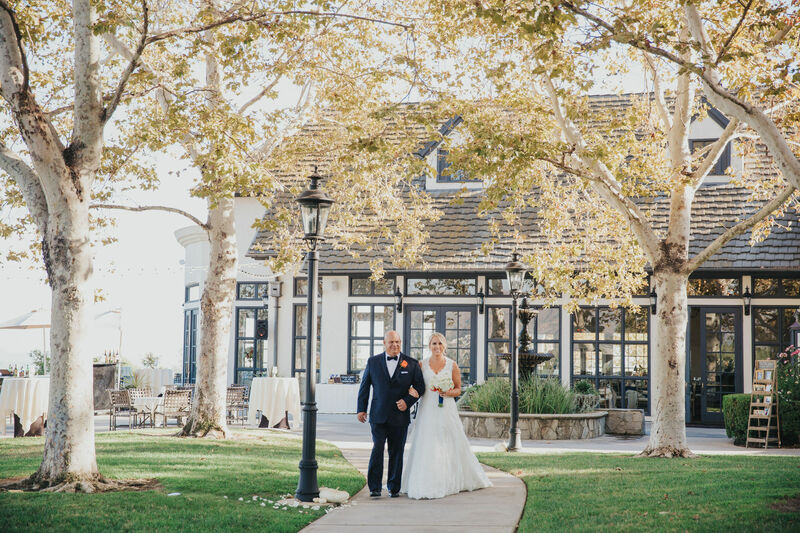 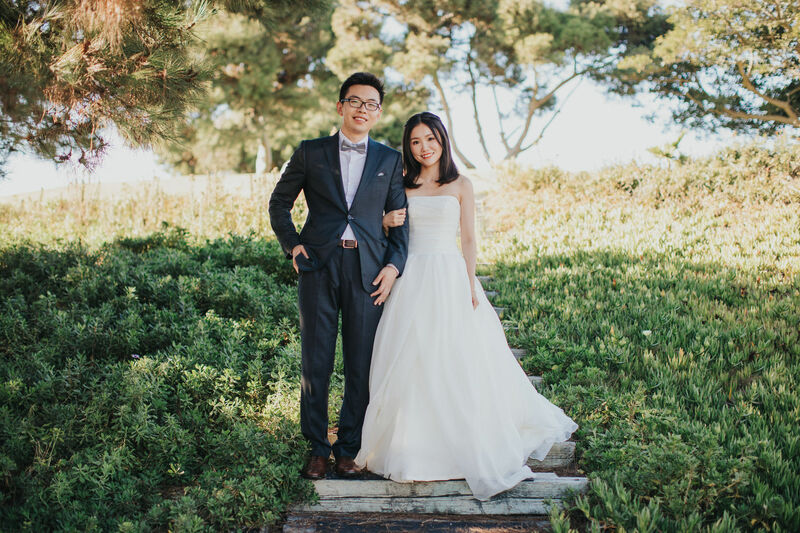 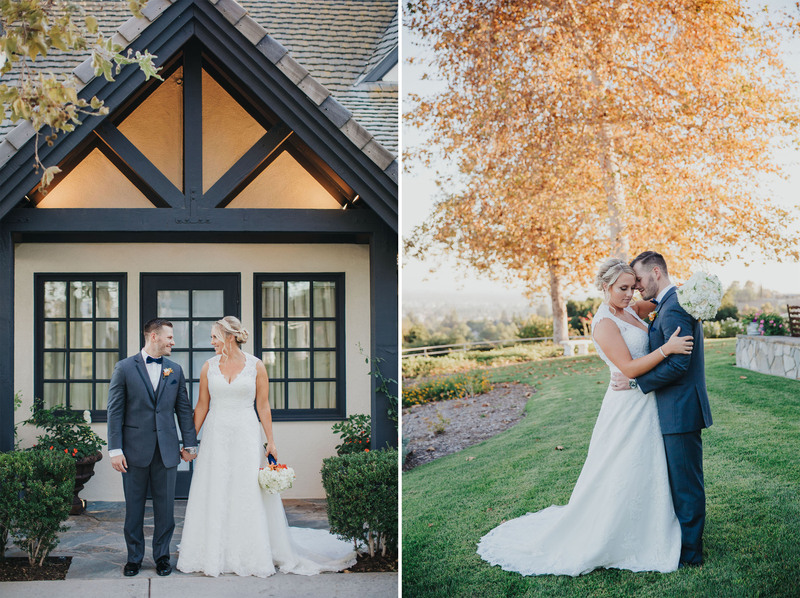 Summit House in Fullerton, California is the ultimate setting for a rustic dream wedding. 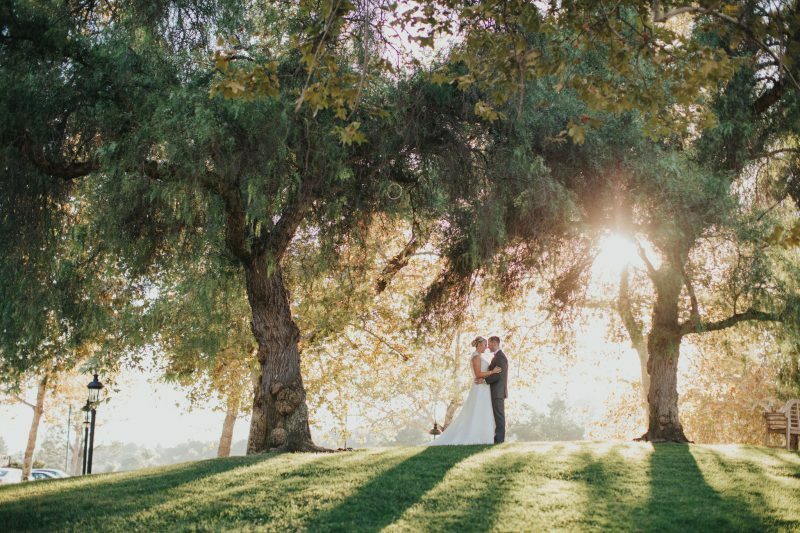 The panoramic views of Orange County and the San Bernardino Mountains are absolutely breathtaking. 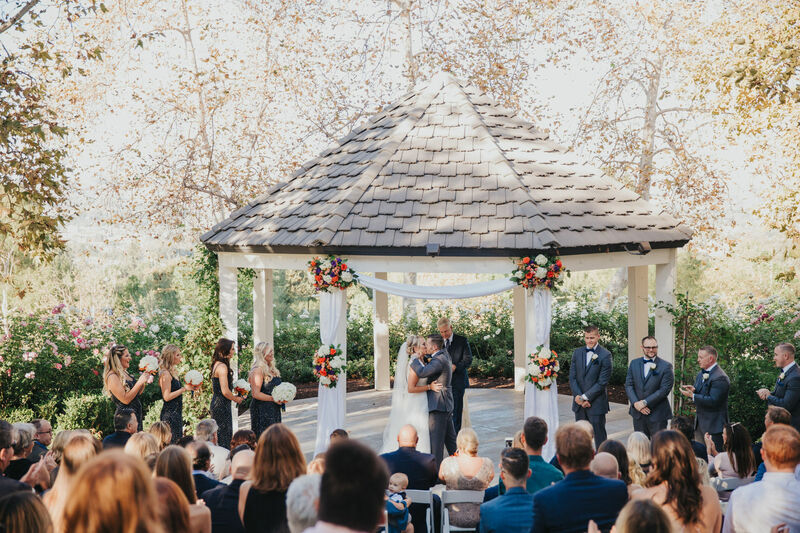 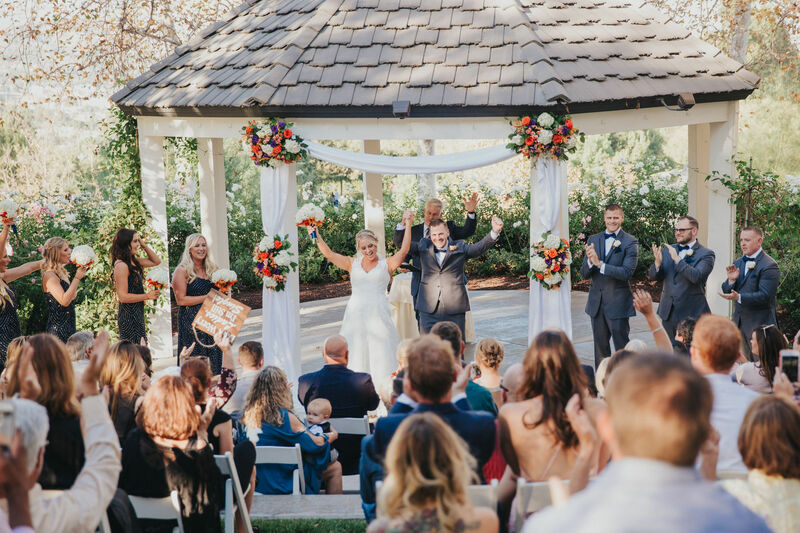 Now, if you’re looking for a wedding venue that offers a beautiful outdoor ceremony spot, look no further! 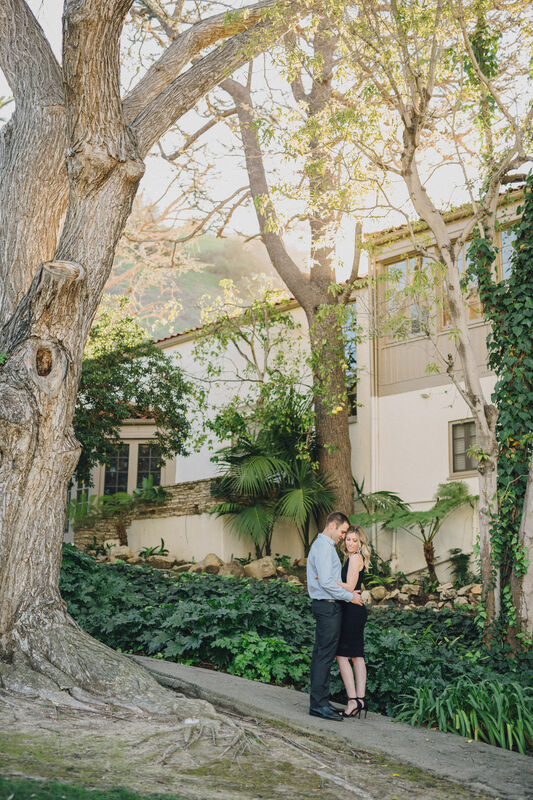 Summit House is right next to Vista Park, certainly giving a peaceful garden vibe. 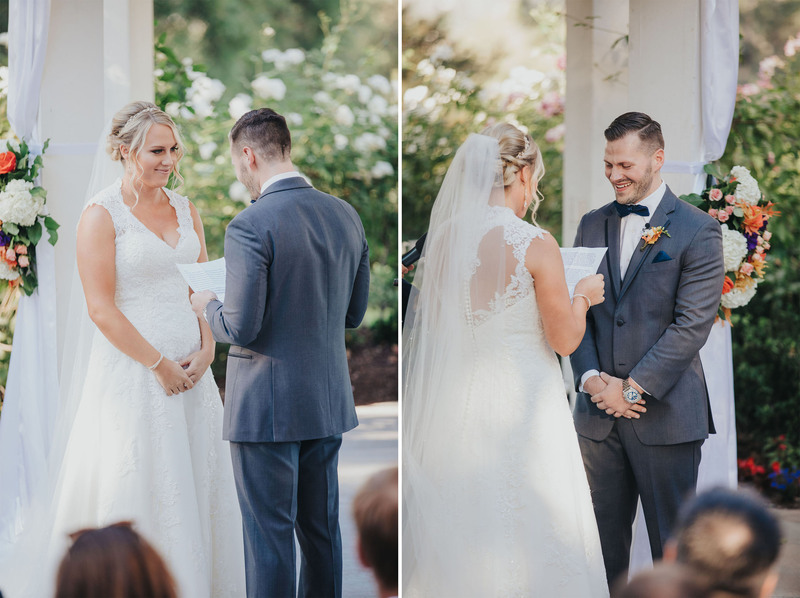 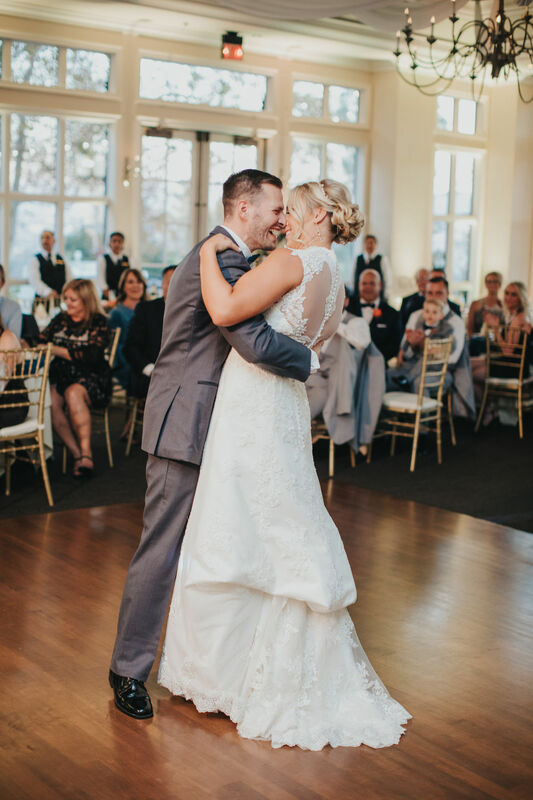 Laughter and tears emerged from the crowd while Maloree and Joey read their vows. 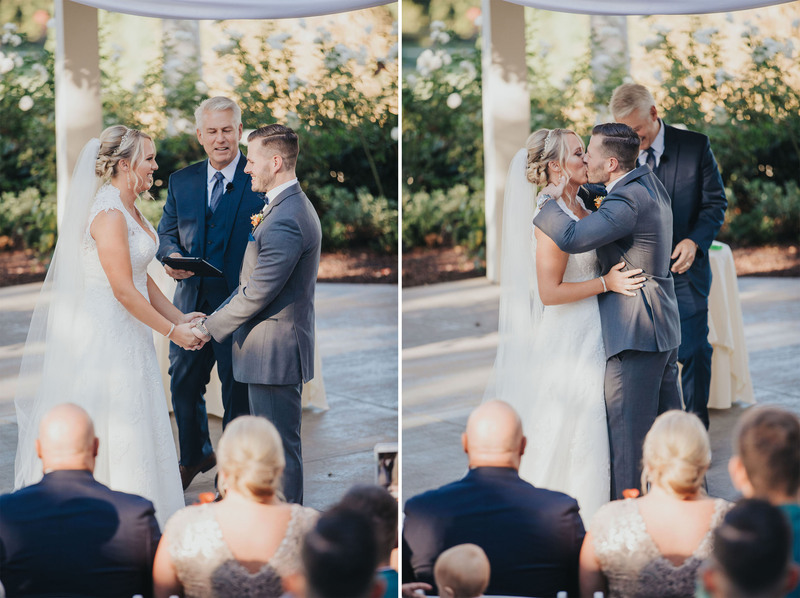 Finally, the moment we have all been waiting for, they are announced Mr. & Mrs. ! 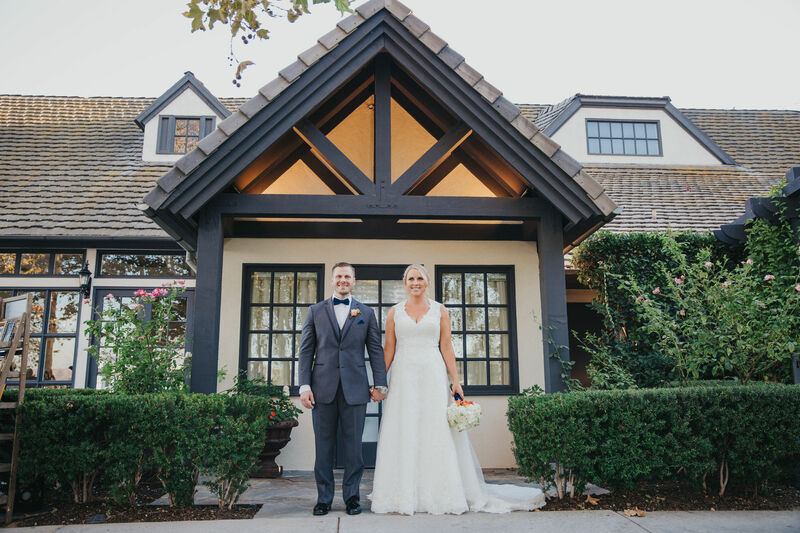 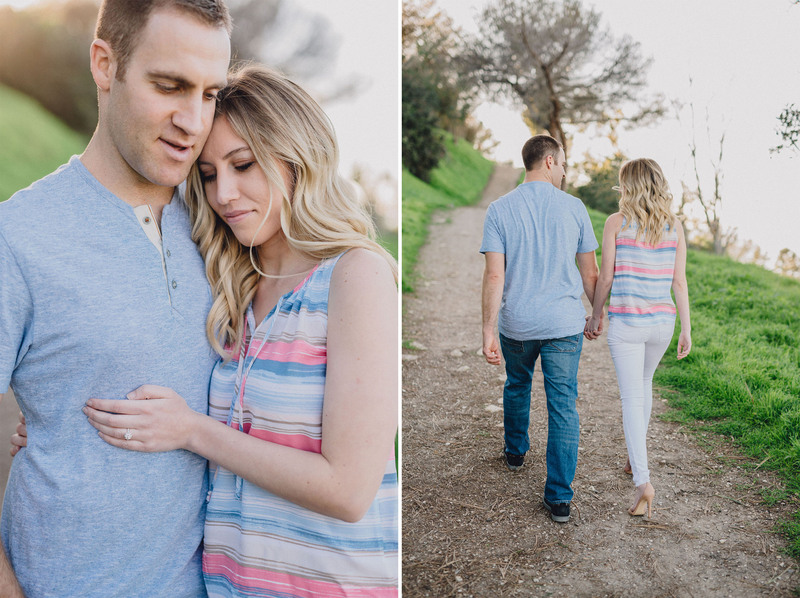 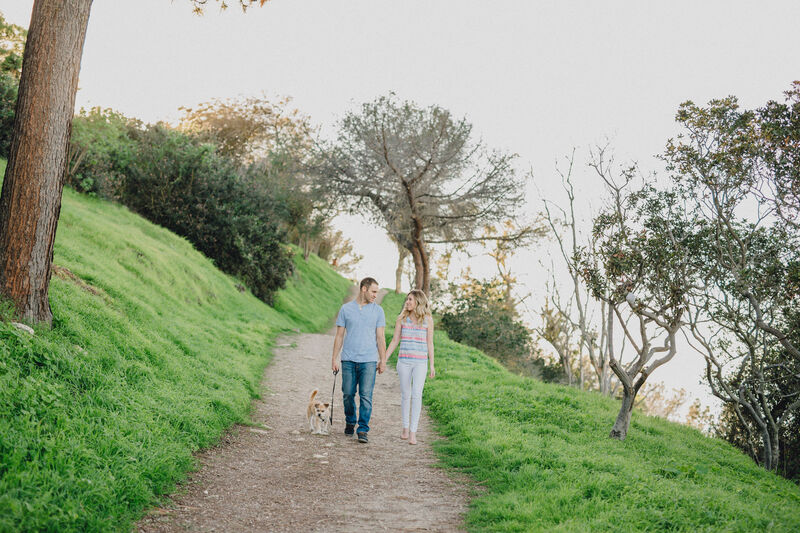 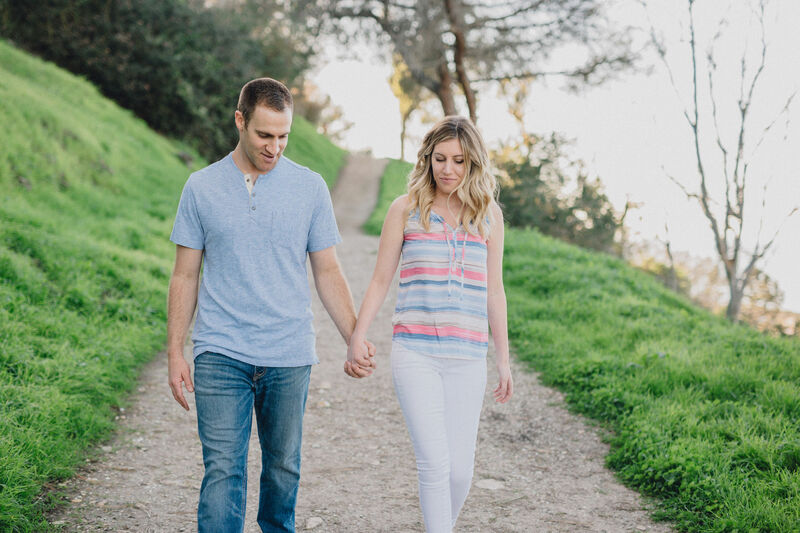 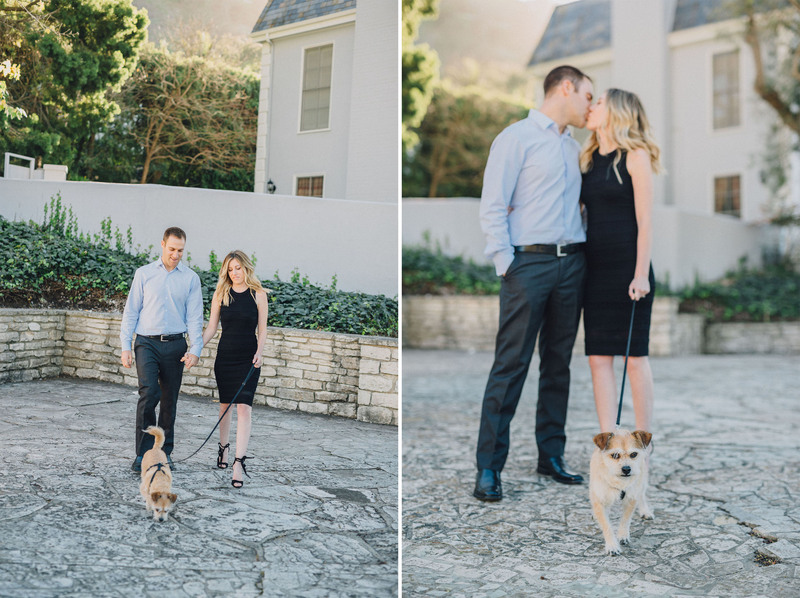 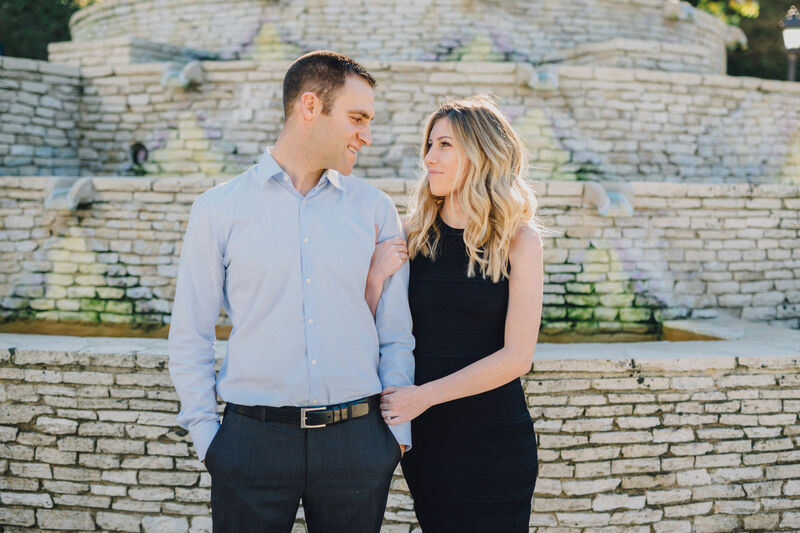 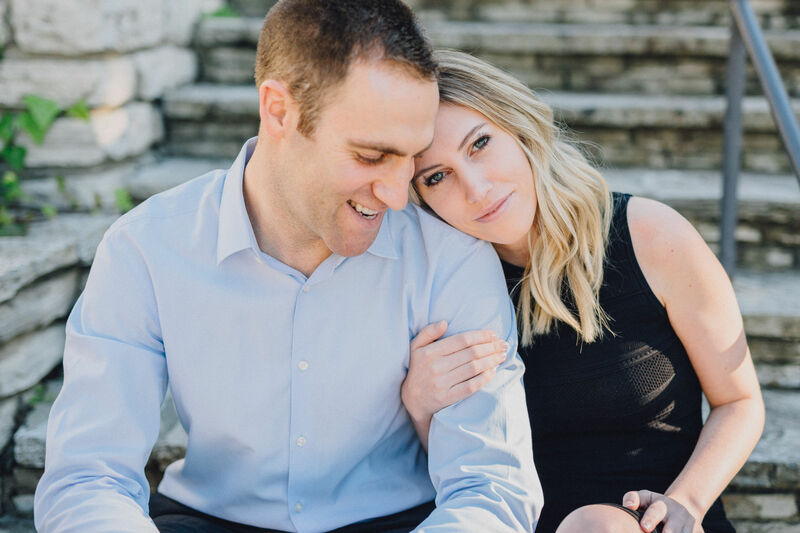 Now it’s time to sneak away with the newlyweds to take advantage of Summit House’s exquisite gardens and views. 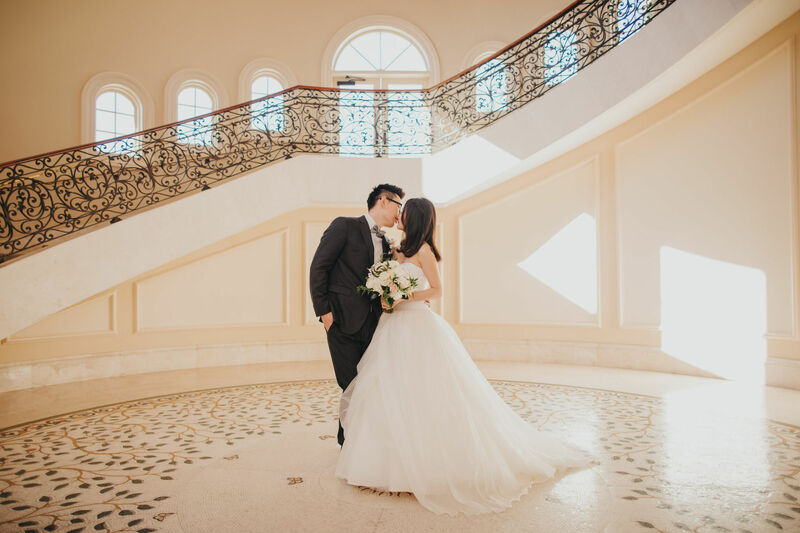 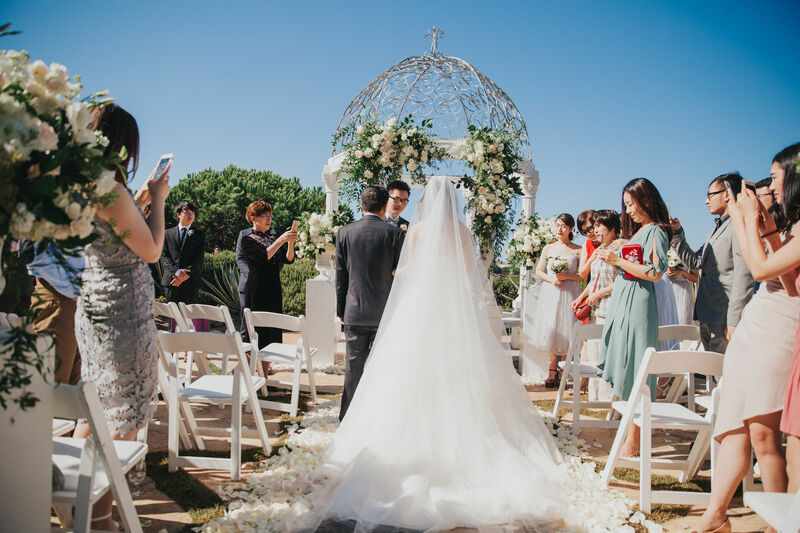 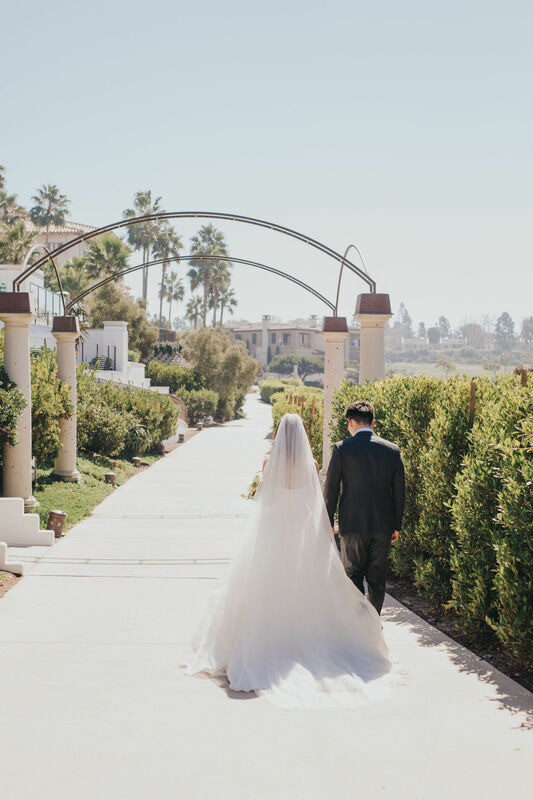 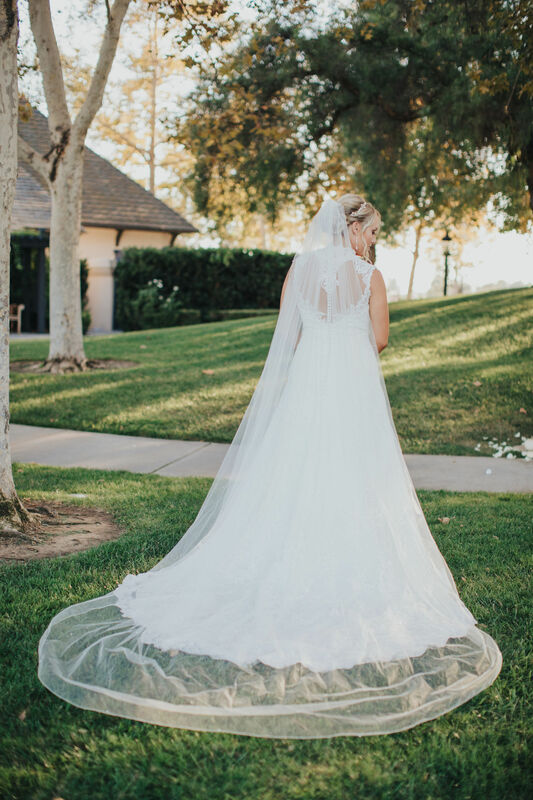 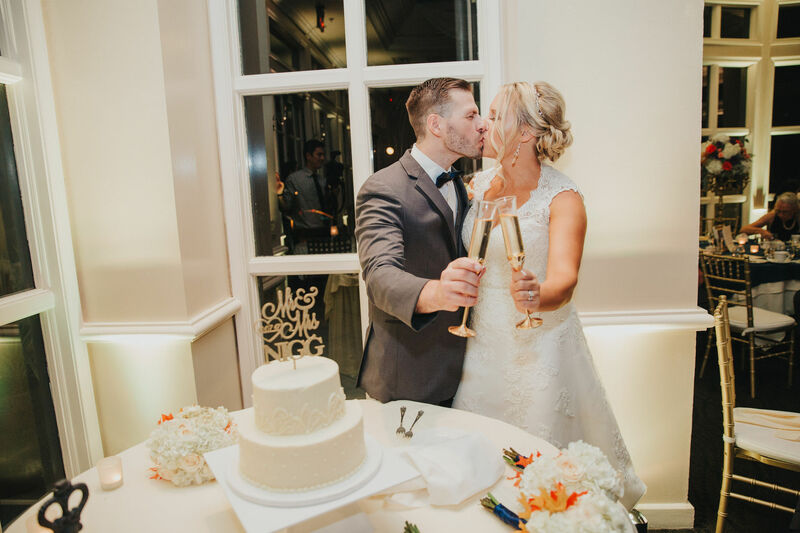 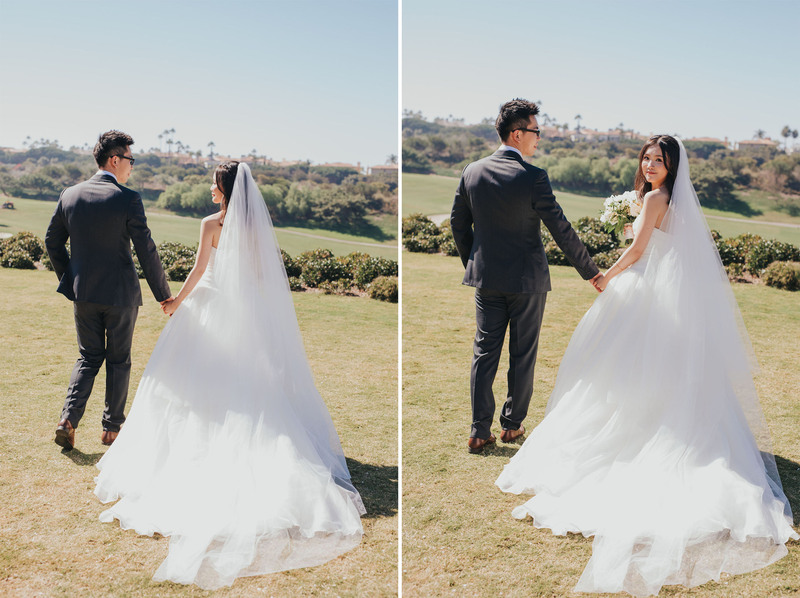 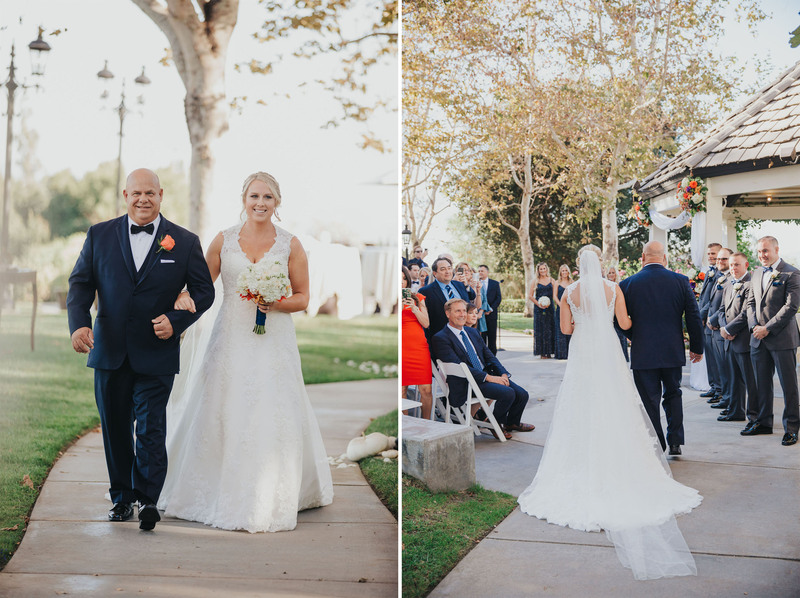 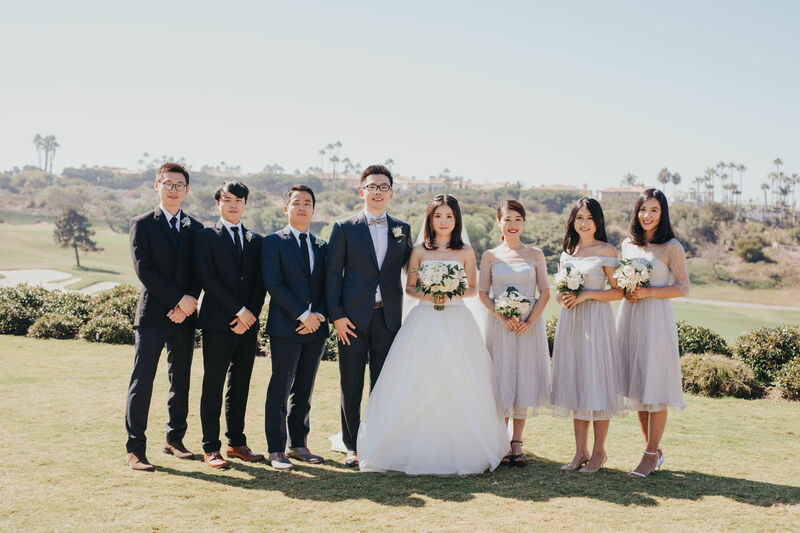 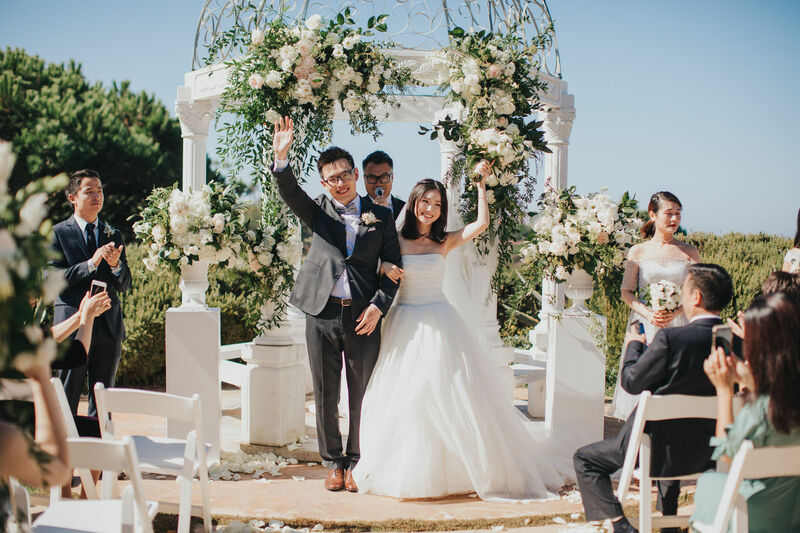 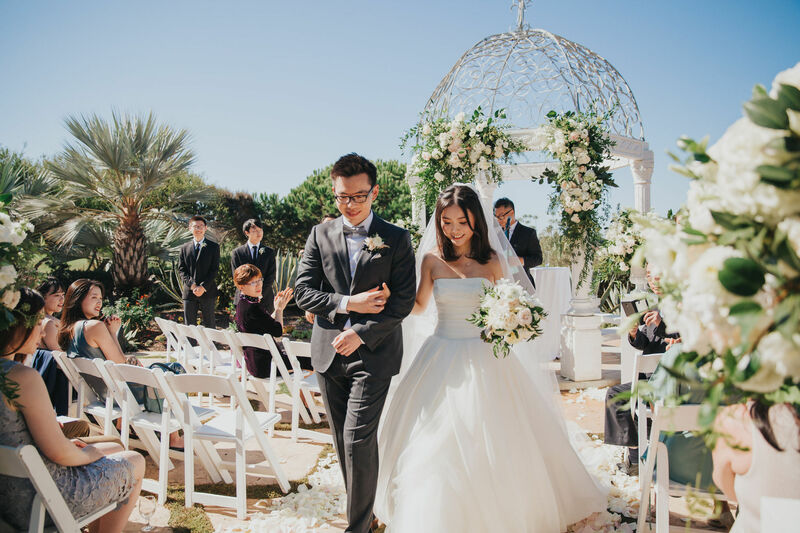 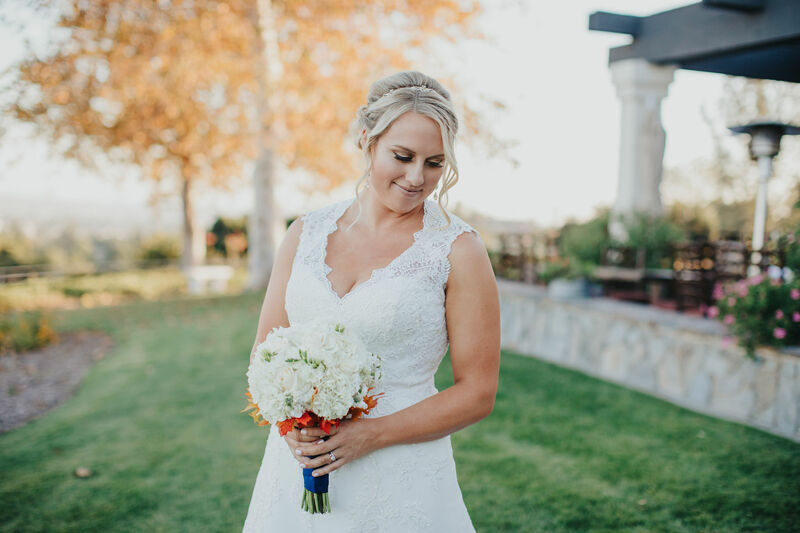 First of all, we were stunned by Maloree’s lace wedding gown, which was detailed with a see-through beading back and floor sweeping white veil. 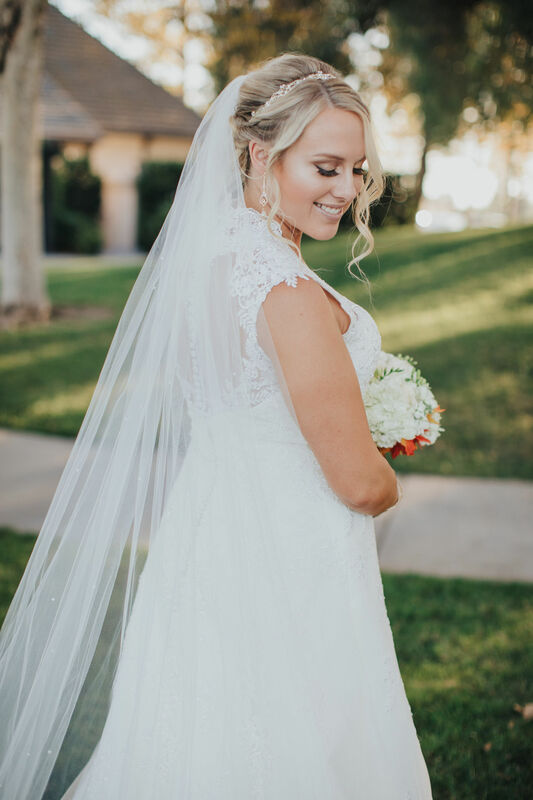 Also, she completed the look with a gorgeous sparkle headpiece. 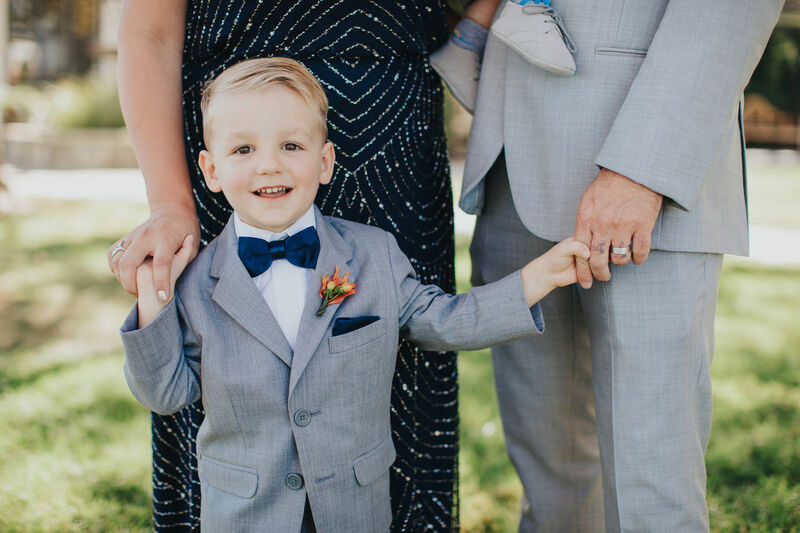 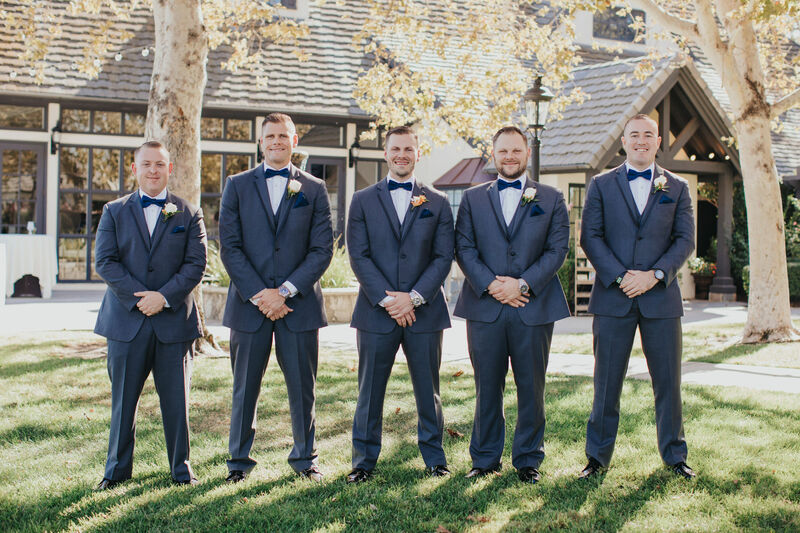 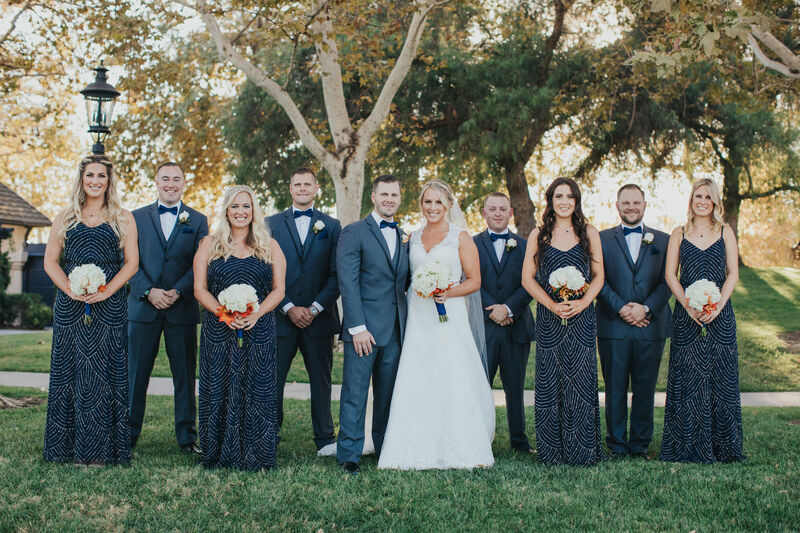 Joey opted for a blue suit with a bowtie that matched the theme colors of the wedding. 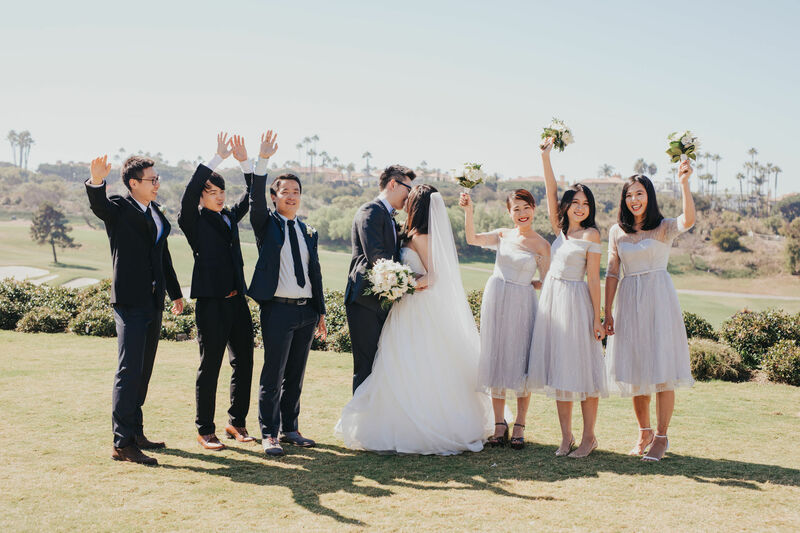 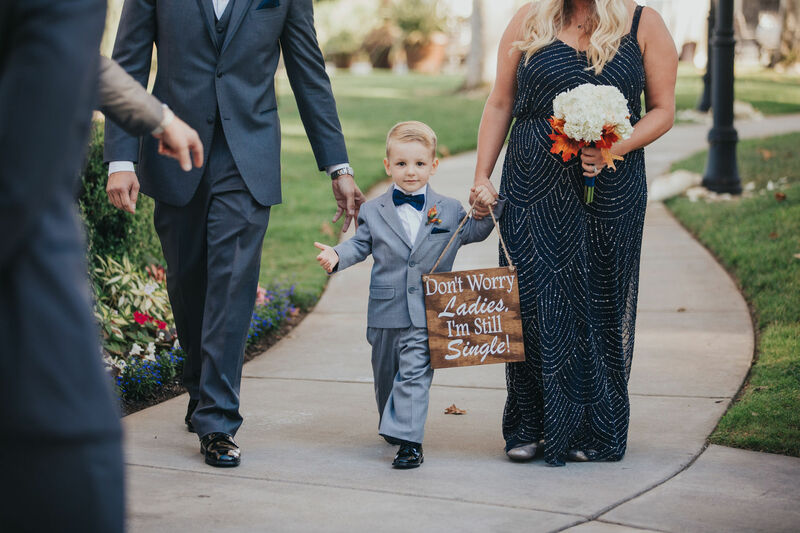 Take notes brides to be because this wedding features some fun wedding tips! 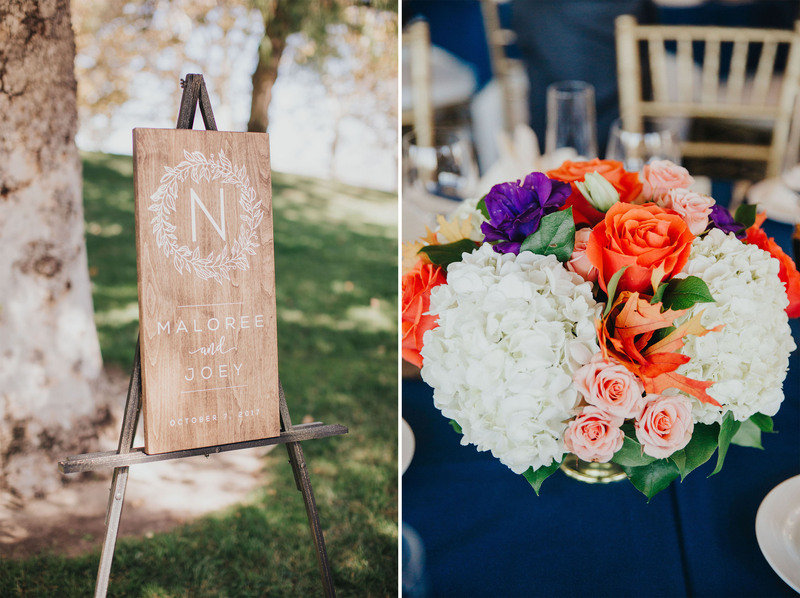 The creativity of the decor in Maloree and Joey’s wedding brought excitement to the guests as soon as they arrived. 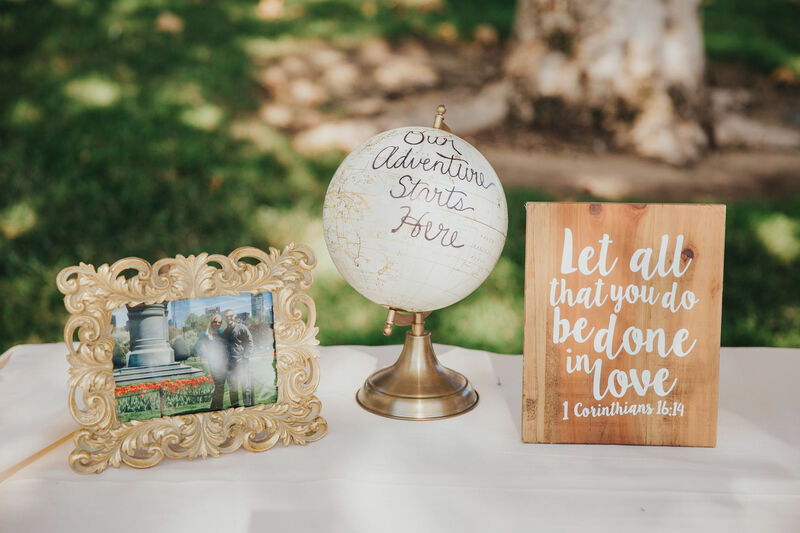 The welcome table featured a globe that read “Our Adventure Starts Here” with pictures of the lovely couple. 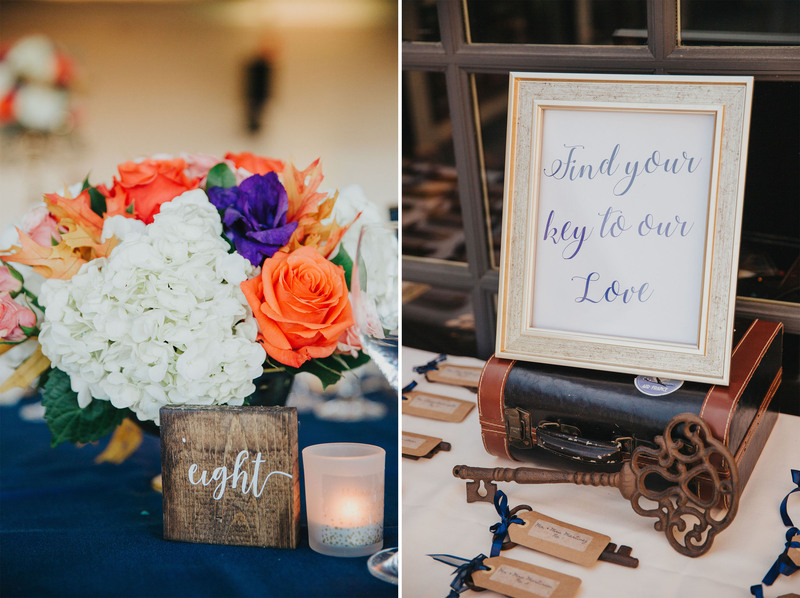 Furthermore, scattered throughout the venue were signs with love quotes. 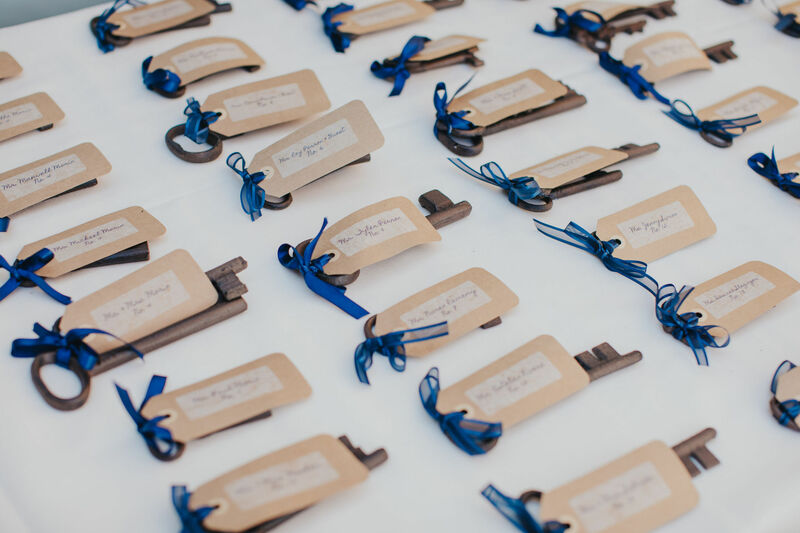 The place cards were attached to keys, which were placed alongside a sign that said “Find The Key To Our Love”. 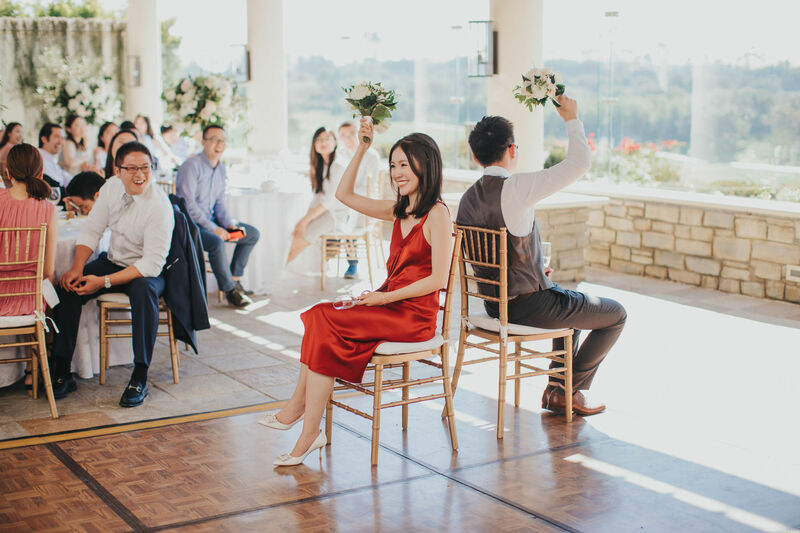 It doesn’t end there… guests had a blast taking polaroid pictures and leaving well wishes in what they called their “Adventure Book”. 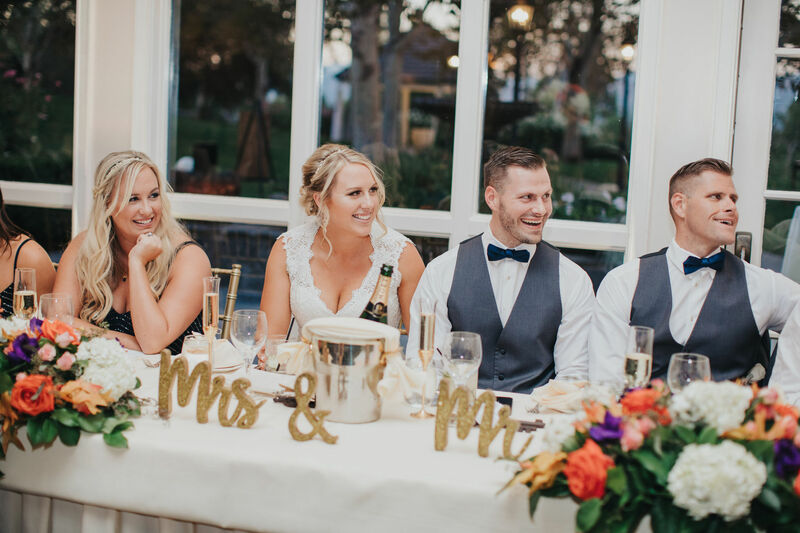 The bride and groom left thank you notes for guests at their place settings. 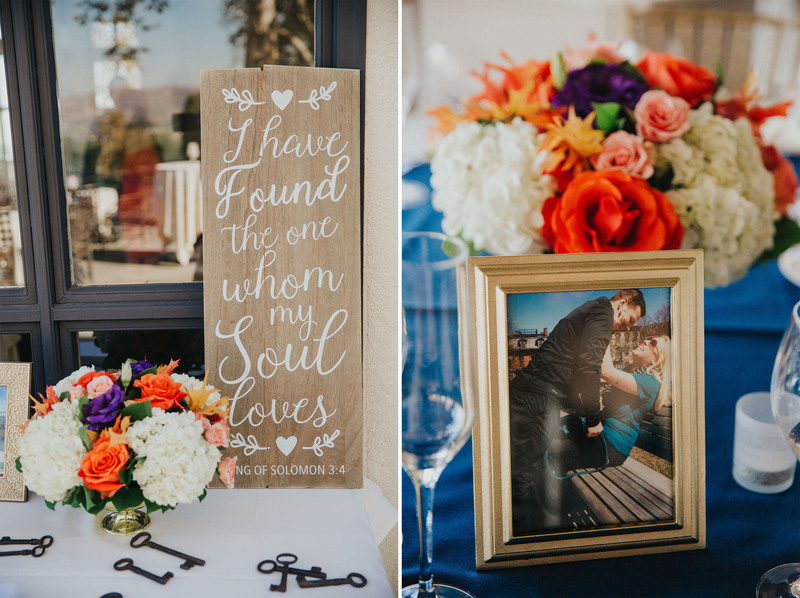 Also, each table had a picture showcasing some of their favorite moments. 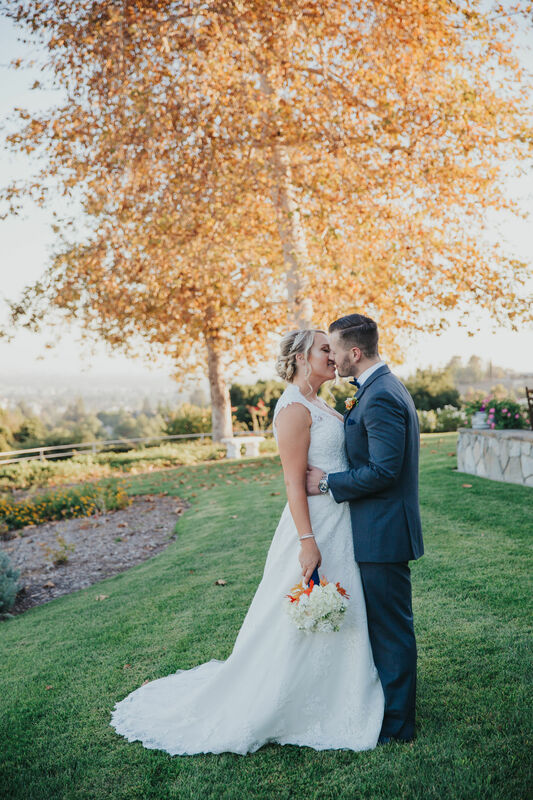 We just couldn’t get enough! 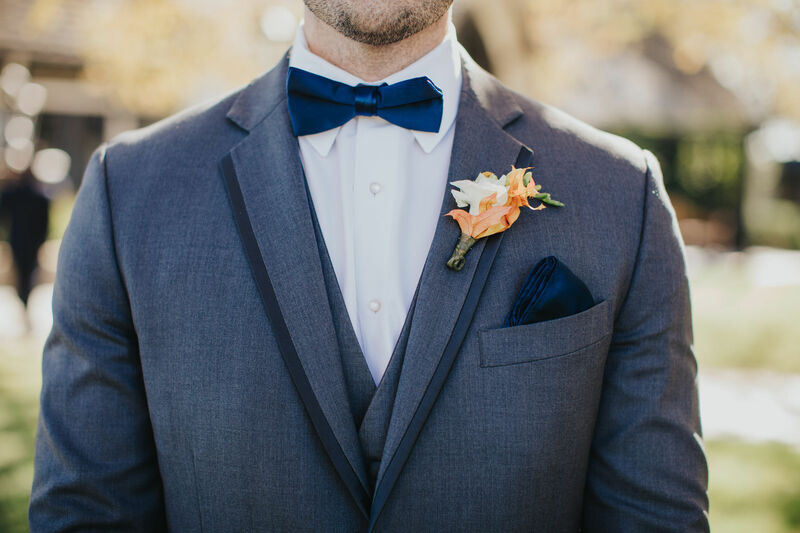 I know what you are all thinking… what about the florals? 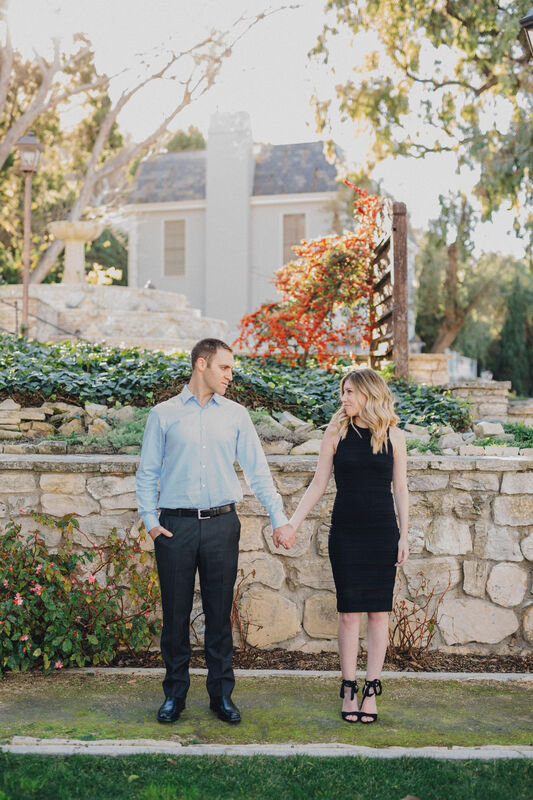 A few words that come to mind? 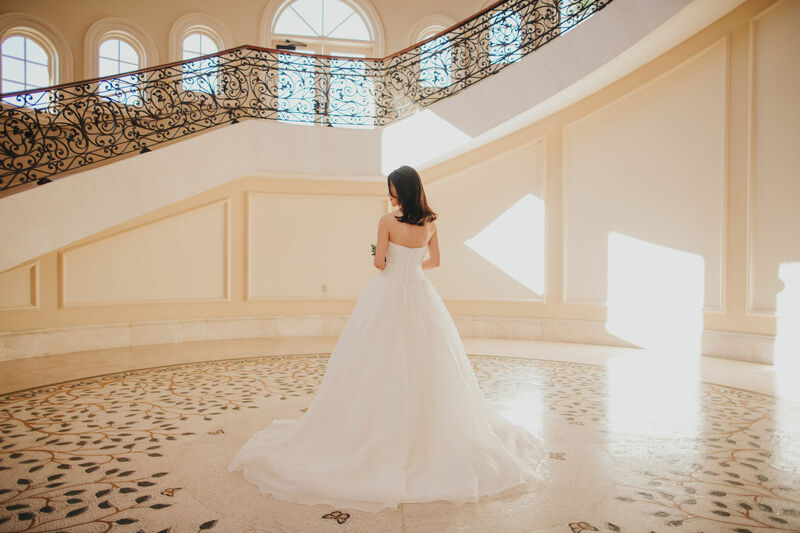 Elegant and stunning! 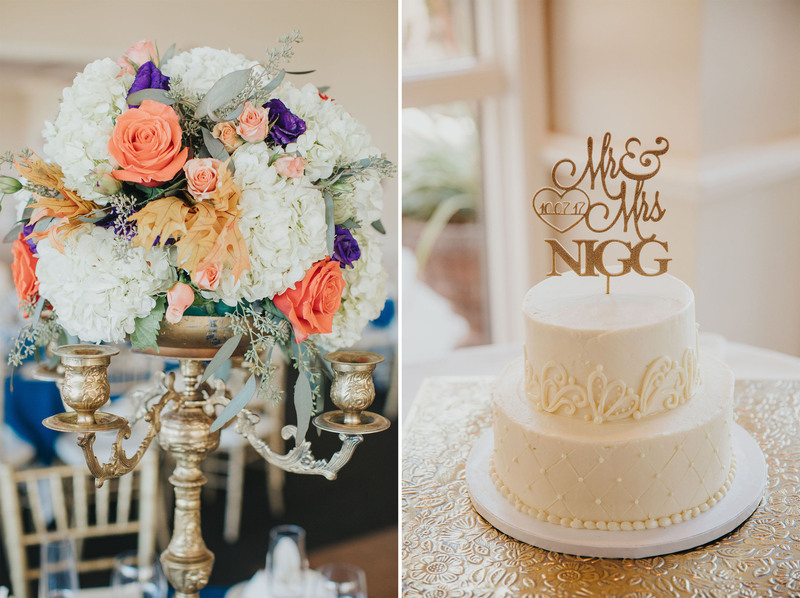 They opted for a mixture of high and low centerpieces. 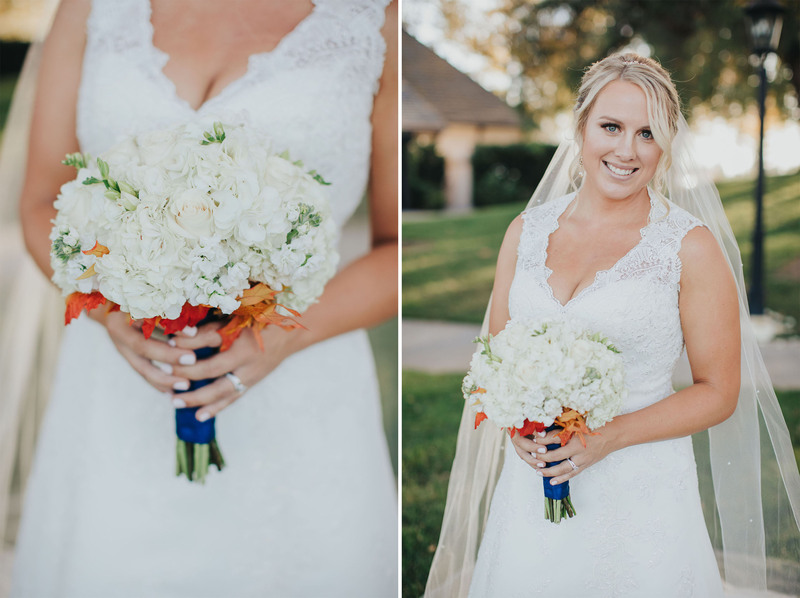 Everyone’s favorite florals like white hydrangeas with peach and orange roses which created a pop of fall colors. 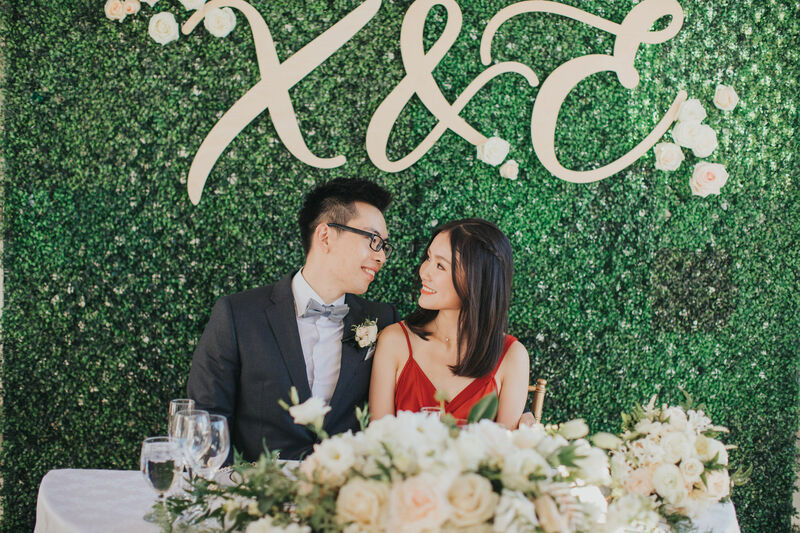 Most noteworthy, they included some fall leaves to highlight the fall wedding vibe. 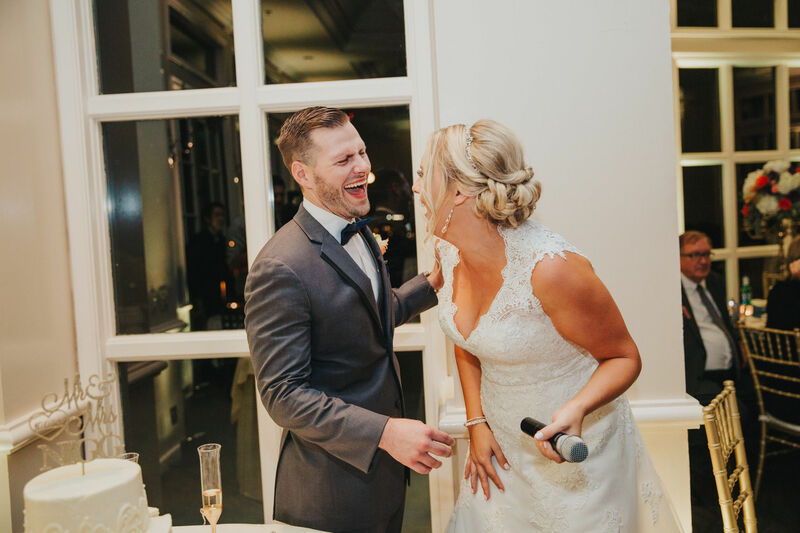 As the night continued, so did the wedding traditions, which really got the party started. 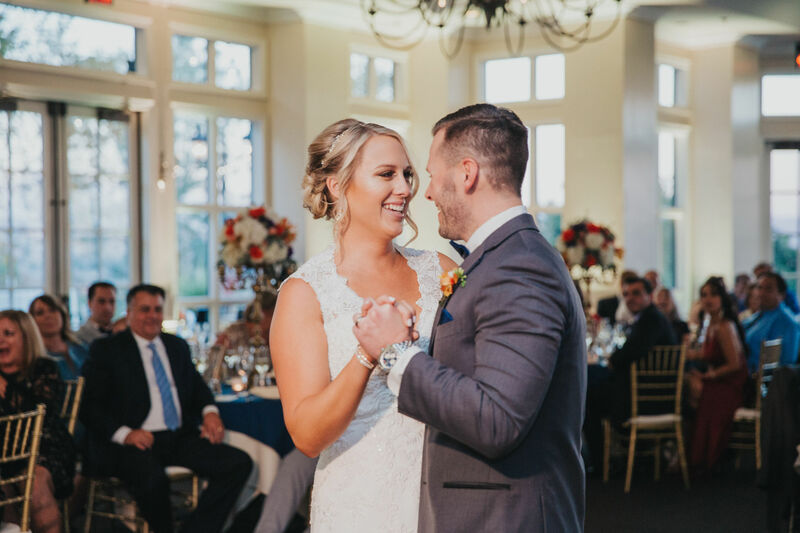 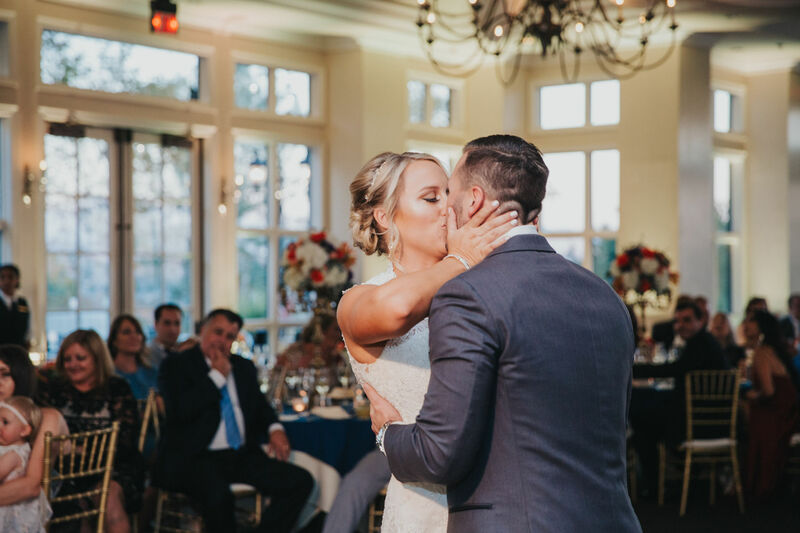 The newlyweds danced the night away with their friends and family. 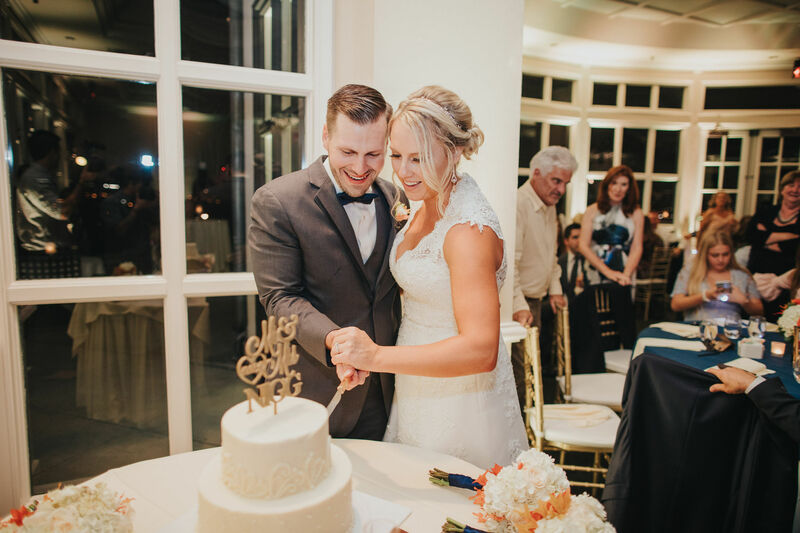 Let’s not forget, the chocolate fountain and wedding cake! 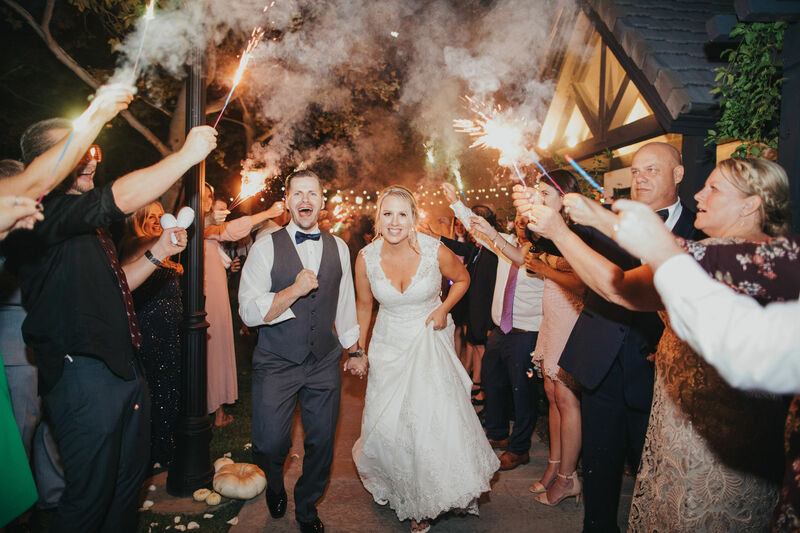 After endless dancing and delicious desserts, guests grabbed a sparkler as Maloree and Joey made their exit. 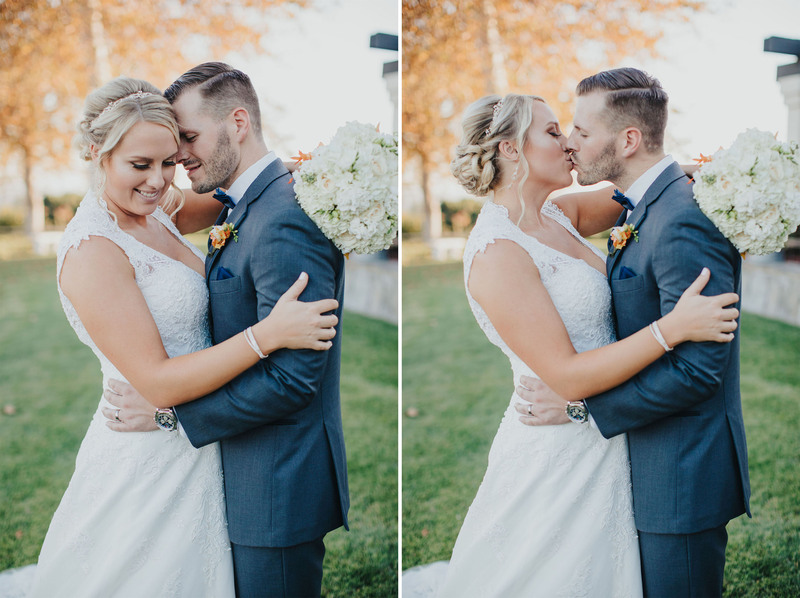 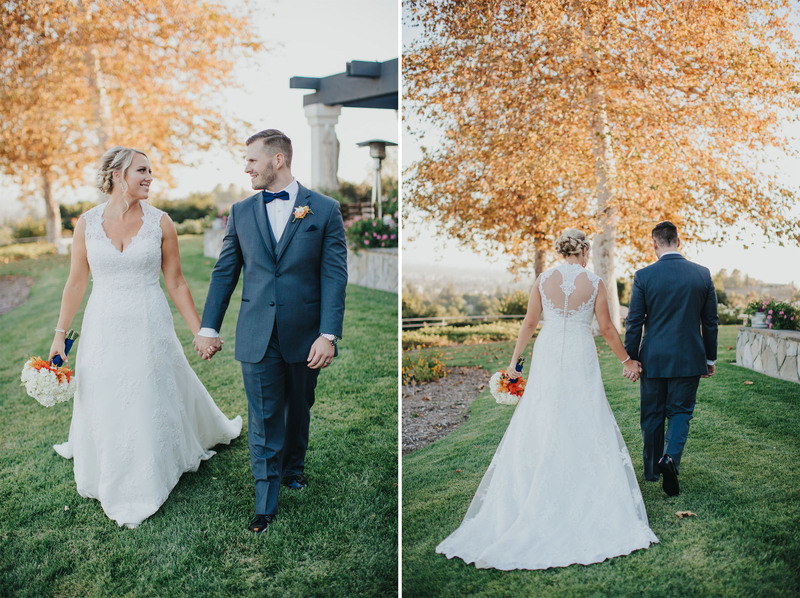 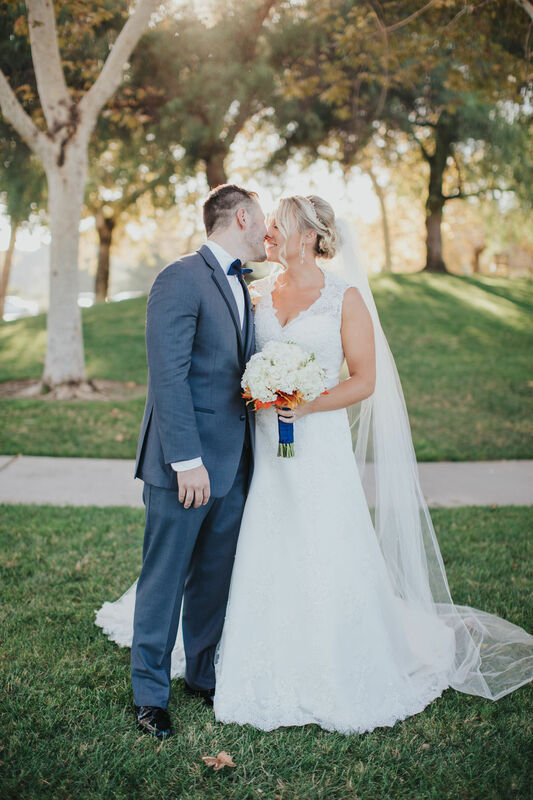 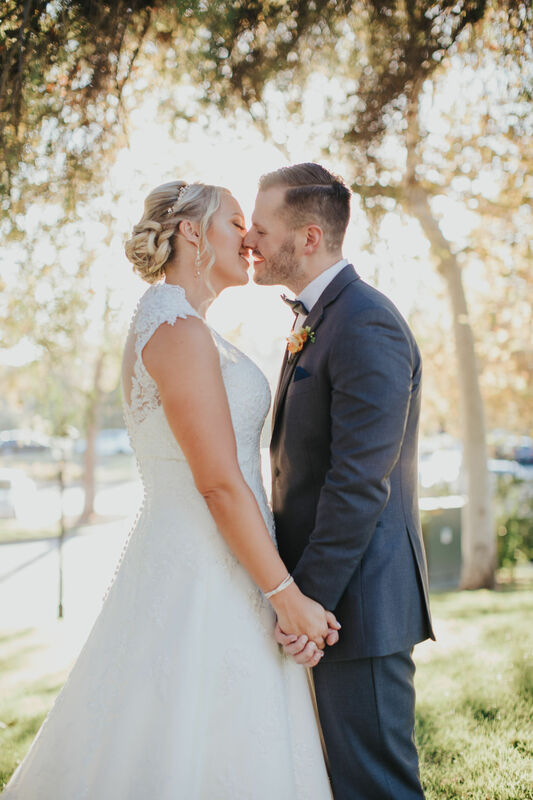 Above all, it was the most wonderful fall wedding for this beautiful couple.